Há colecionadores excêntricos que preferem cinderelas. Franco Bollo Postale- Real or Not? O que é um “selo-pôster”? De qualquer forma são grandes gráficos! Desde a sua criação tem sido visto tanto como um pôster em miniatura, com tudo o que isso implica, ou um colecionável também. Abaixo (do lado esquerdo da tela), Denmark Maerkat Label (sk70), mostra o mapa da África com girafa, identificando o território da ex-Tanganica, atual Tanzânia. No centro da tela, selo-pôster da Dinamarca: “Schous Kaffesurrogater – Samlermaerke Nº 437”, 1970? (adquirido de Cezar em 09/10, R$40)... Do lado direito, escrito em neerlandês a palavra “GIRAFFEN” que significa girafas. Algumas empresas dinamarquesas de cigarro começaram a produzir cards em 1886. 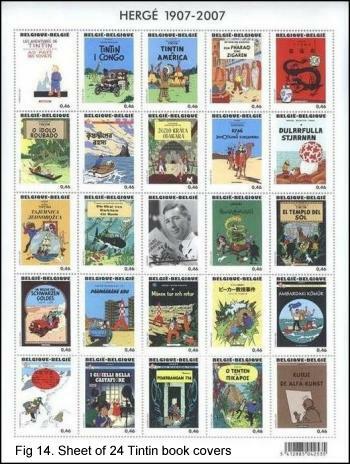 Os tipos de emissões eram variados, conhecidos como selos-pôster (Poster Stamps), selos-cinderela (Cinderella Stamps), rótulos colecionáveis (Samlermaerke), marcas de publicidade (Reklamaerke) etc. Também uma espécie de cartão de papelão, tradicionais cartões de cigarro (cardboard, traditional cigarette cards). Cerca de 20 anos depois, algumas empresas internacionais como a Copes, Lambert & Butler, BAT, entre outras, começaram a importar cartões para o mercado dinamarquês. Pequenos álbuns apareceram em meados da década de 1920 para abrigar as séries de cartões, especialmente para Bell, Lambert & Butler e as empresas dinamarquesas Kanaris & Yacht. No entanto, em 1927, houve um acordo entre as empresas locais e internacionais de não emitir cartões em seus pacotes de cigarros devido ao custo de fazê-los. Assim, poucas emissões de tabaco foram produzidas após esse período e, destes, a maioria parece ser da Cigarro e Charuto Tabaco Samlermaerke (Cigar & Pipe Tobacco Samlermaerke). Fonte: Danish Cigarette Cards (www.cardmine.co.uk/danish-c.htm)." 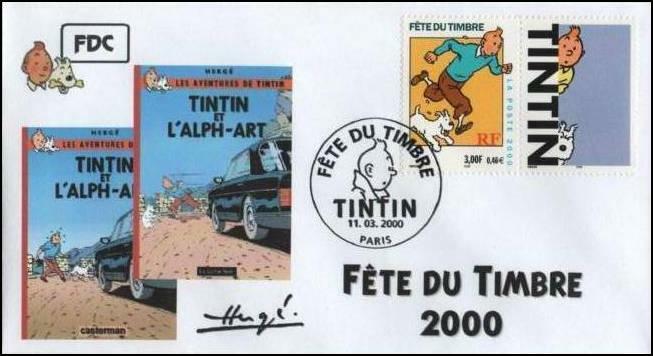 By David H. AhlBeing a major fan of Tintin since the books were first available in English in the mid 70's and also being a stamp collector, I perked up when Belgium issued a Tintin stamp in 1979. But as with so many subjects, it was only one stamp and certainly not the basis for any kind of topical collection like cats, the Olympics, space exploration, Amelia Earhart, or auto racing, which are other interests of mine. Tintin was a comic character created by Hergé, but, wait, we need a little background. 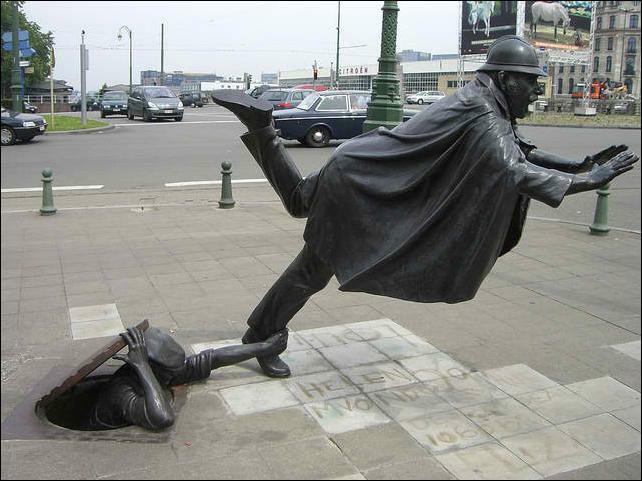 Georges Prosper Remi was born into a middle-class family in Etterbeek, Brussels on May 22, 1907. As a youngster, he was keenly interested in Scouting, something that would prove highly influential on his later work. He initially produced illustrations for the Belgian Le Boy-Scout magazine, including an illustrated story, Les Aventures de Totor, C.P. des Hannetons (The Adventures of Totor, Patrol Leader of the Cockchafers (UK) or Maybugs (the more common translation). In1927 he began working for the conservative Catholic newspaper Le XXe Siècle, where he adopted the pen name “Hergé,” based upon the French pronunciation of “RG,” his initials reversed. After Totor came a number of short-lived characters such as Tim the Squirrel, Tom and Millie (Tim had morphed into a bear cub named Tom), Fred and Mile, Mr. Mops, Popol and Virginie, and Dropsy. But by far his best-known character was Tintin, the star of a series of 24 book-length adventures (one uncompleted), which he wrote and illustrated from 1929 until his death in 1983. He also created two other well-known comic book series, Quick & Flupke (1930-1940) and Jo, Zette and Jocko (1936-1957). Two pages of Tintin in the Land of the Soviets first appeared on January 10, 1929 in black and white on the pages of Le Petit Vingtièm e a weekly youth supplement to Le Vingtième Siècle, the renamed Le XXe Siècle. The story, which ran until May 8, 1930, chronicled the adventures of a young reporter named Tintin and his pet fox terrier Snowy (Milou) as they journeyed through the Soviet Union. A year later in January 1930, Quick & Flupke, two street urchins from Brussels, made their debut in what was to become a series of 310 self-contained two-page comic strips (called “gags” in Europe). The Quick & Flupke strips were especially clever because many of them had both a visual gag and a verbal one. This makes them somewhat difficult to translate into other languages when the verbal gag involves a pun or rhyming words in French. (I should know, having translated 48 of these strips). Hergé says, “I had to abandon these rascals (in 1936) because they were causing me a lot of worry as I became increasingly occupied with Tintin.” Two pages of Tintin continued to appear every Thursday until May 1940, when the Germans invaded Belgium. As the war progressed, paper shortages forced Tintin to be published in a daily three- or four-frame strip, which meant that Hergé had to introduce more frequent gags and faster-paced action. Also, in order to avoid controversy, the focus of the adventures had to be moved away from current affairs. In 1943 Hergé met Edgar P. Jacobs, another comic artist, whom he hired to help update, revise, and redraw the early Tintin albums. Tintin was always credited as simply “by Hergé,” without mention of Edgar Jacobs, Bob de Moor, or any of Hergé's other assistants. As Jacobs' contribution to the production of the strip increased, he asked for a joint credit, but Hergé refused. Nevertheless, they continued to collaborate until 1946, when Jacobs left to produce his own comics for Tintin Magazine, including the widely-acclaimed Blake and Mortimer series. 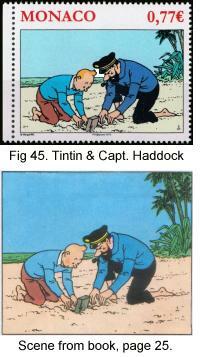 Almost all of the Tintin adventures have a vivid humanism and a realistic feel produced by meticulous and wide ranging research, and, of course, Hergé's drawing style. 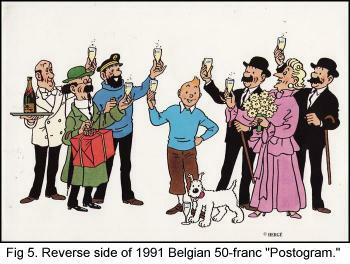 Even adults enjoy Tintin for the many satirical references to the history and politics of the 20th century. 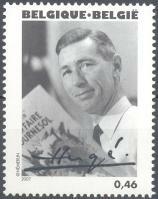 Hergé died on March 3, 1983 at age 75, having become a prominent national hero in his native Belgium. An Hergé Museum was opened in Louvain-La-Neuve in June 2009. And to this day his work remains a strong influence on comic artists, especially in Europe. For several reasons, collecting stamps and covers related to Hergé and Tintin is not as easy or straightforward as might be expected. 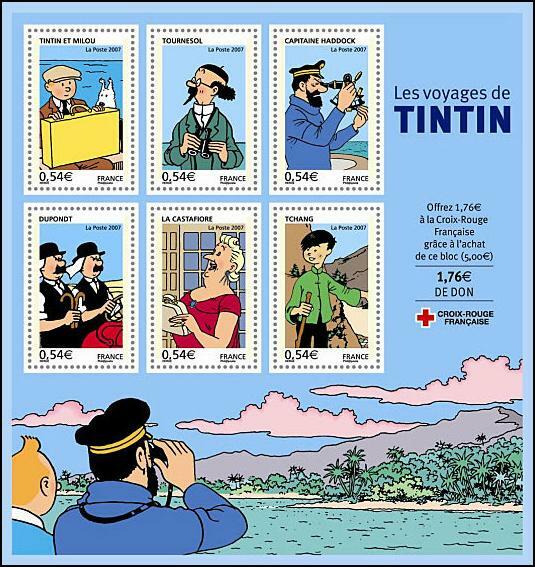 There are any number of web sites that focus on Hergé and Tintin philately, most of which are woefully inadequate and incomplete. But how complete is complete; how big a circle do we wish to draw? 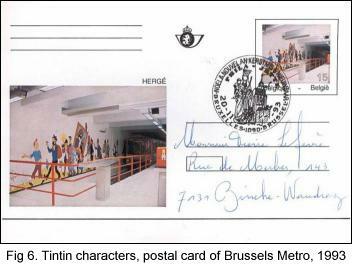 Do we include the Belgian 1993 metro station postcard that depicts a mural by Hergé of Tintin characters? Of course. 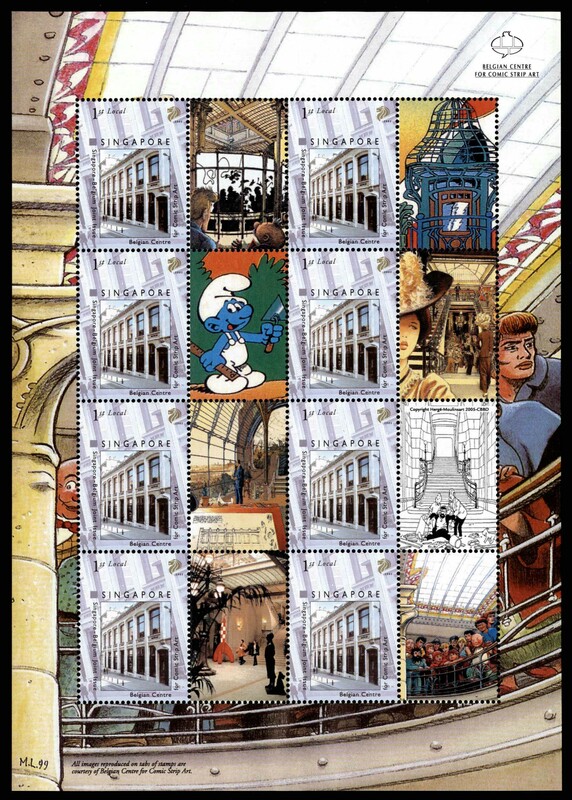 Do we include the Belgian 1999 block of nine stamps of the Comic Strip Museum? 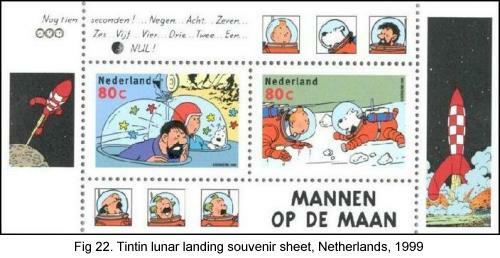 Yes, because the center stamp pictures a model of Tintin's moon rocket ship. 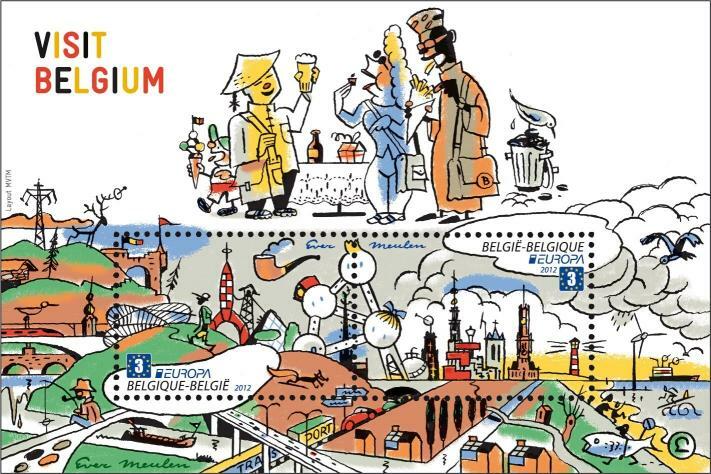 How about the 2012 Visit Belgium Europa stamp? 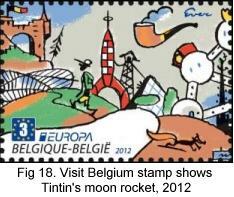 Yes, it also depicts Tintin's moon rocket. 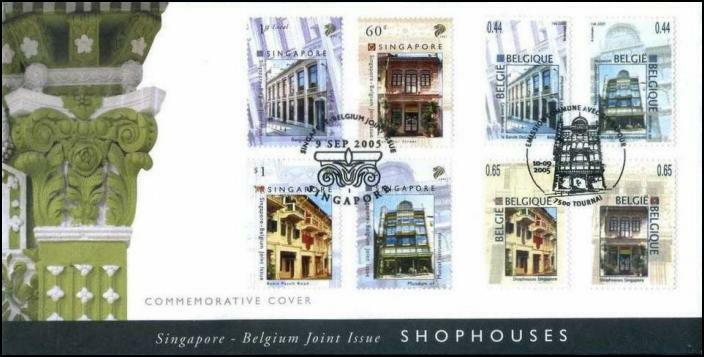 Do we include the Singapore/Belgian 2005 issue picturing shophouses in both countries? 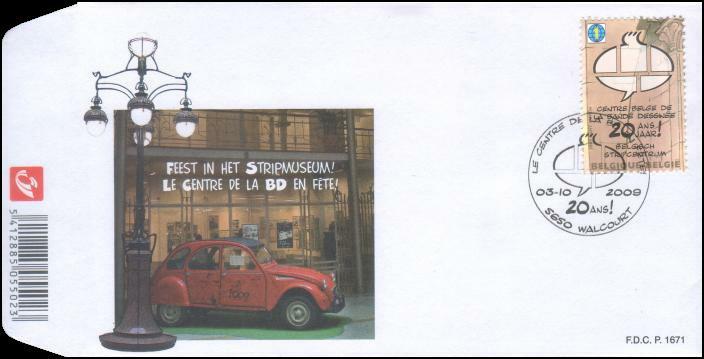 Probably, because the low-value stamp is the Belgian Comic Strip Museum. 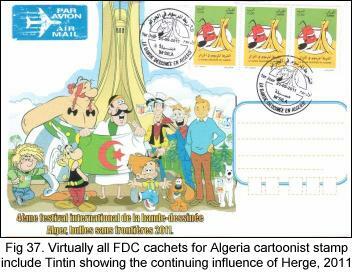 Do we include the Algerian 2011 stamp honoring Comic Art at the 9th Arts Festival? 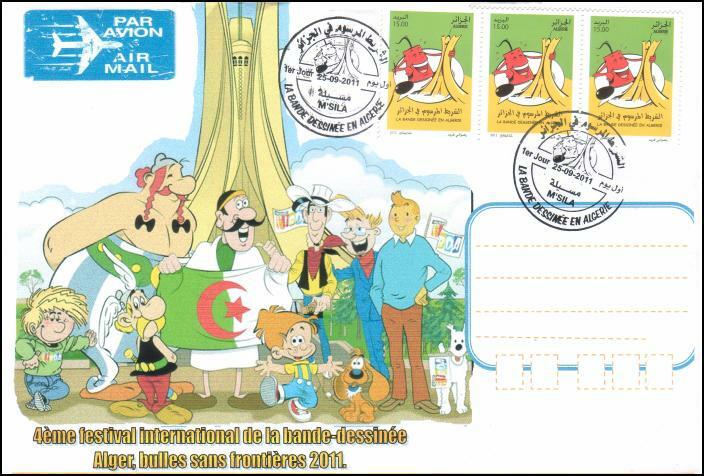 Possibly, because Hergé hugely influenced comic art in French-speaking Algeria and nearly every cachet on First Day Covers for the stamp pictures Tintin. 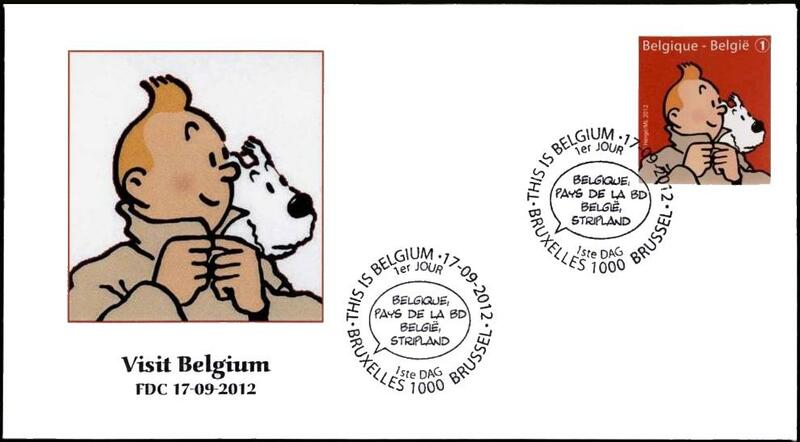 Do we include the Belgian stamps honoring Edgar Jacobs? Probably not, because that would open the door to every comic artist who worked with Hergé or was influenced by him. 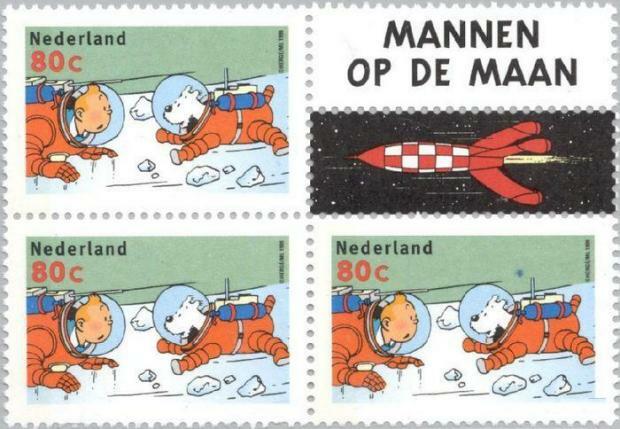 How about a stamp where Hergé's drawing of a compass is incorporated into the design? I think not. We get into muddier waters as we look at stamps and postal stationery of China, India, Romania, and Guinea Bissau as well as personal stamps issued in Belgium, Netherlands, and Canada. There are also some “illegal” stamps issued by Angola and other entities not recognized by the UPU as well as many cinderella stamps and labels. Complicating matters further are the many varieties of postal stationery, some privately produced on legal postal cards, most of which are not cataloged. And finally, there are the out-and-out counterfeits and fakes. 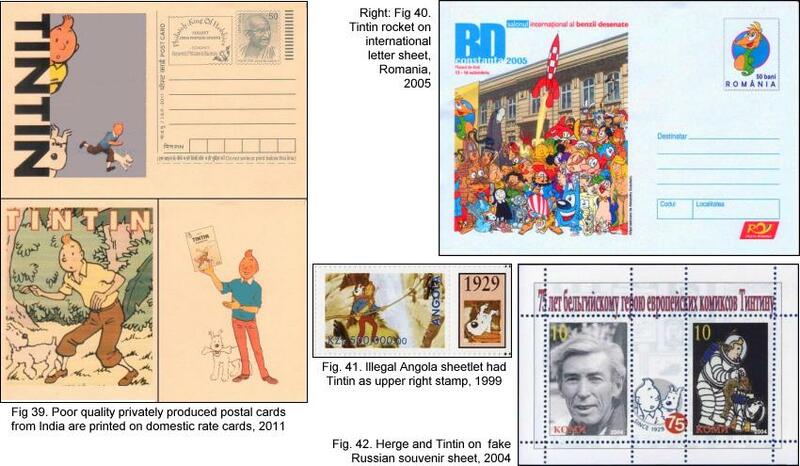 As of year end 2012, there have been 26 legitimate issues by nine countries of stamps, sheets or postal stationery comprising at least 95 separate items related to Hergé. If we add in the Belgian duostamps (read on) and unofficial items, the tally is well over 200 items. 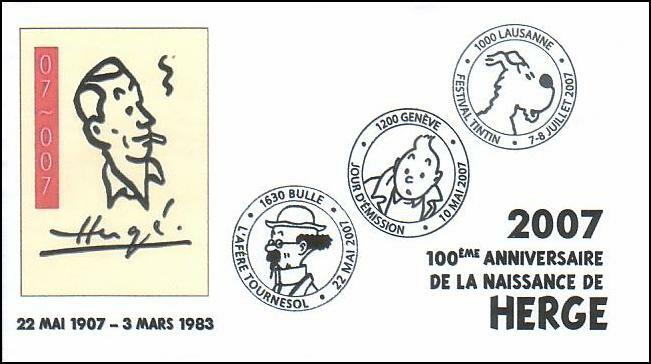 As the birthplace of Hergé, who later became a national hero of the country, we would correctly expect the most issues honoring Hergé to be from Belgium. 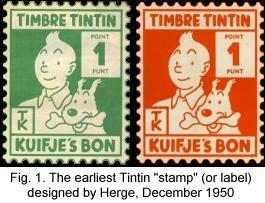 The first time an image of Tintin appeared on what appeared to be a stamp was in Tintin magazine, December 13, 1950 (Fig. 1). 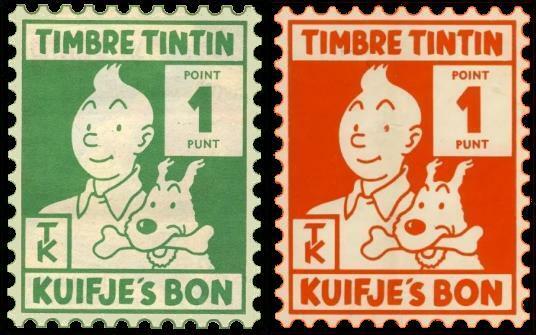 The top, in French, read, “TIMBRE TINTIN” and the bottom, in Dutch, read “KUIFJE'S BON,” in other words, “Tintin stamp.” This design was licensed for use on several products in the 50's such as stationery, chewing gum, chocolate, and the mailing envelope for a collection of small colored photographic scenes of Belgium. 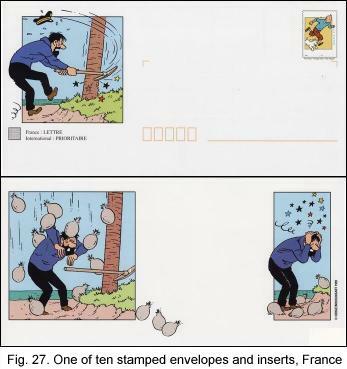 This is not an actual postal item but is interesting as being the first “stamp” designed by Hergé. 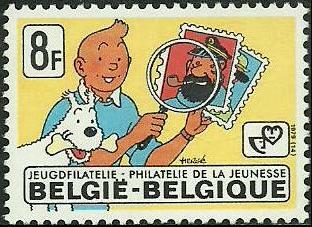 The first actual postage stamp was issued by Belgium on Sept. 29, 1979 and featured a drawing of Tintin and Snowy looking through a magnifying glass at several stamps (Fig. 2). This 8-franc stamp, Scott 1036, was issued in a sheet of 30. 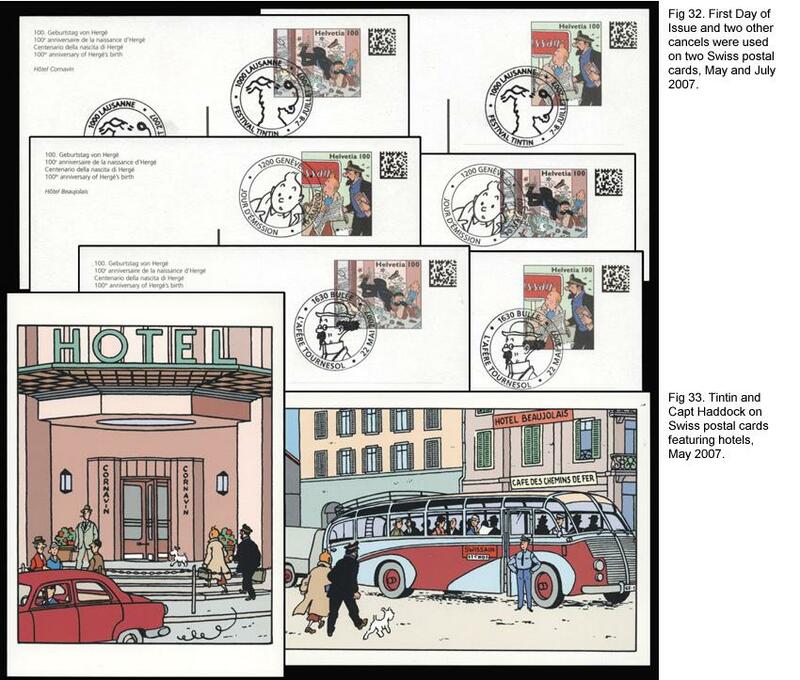 Interestingly, the cachet on the official Belgian Philatelic Bureau First Day Cover picturing elements from various Tintin stories was not drawn by Hergé but rather by the commercial illustrator Chesnot (Fig. 3). 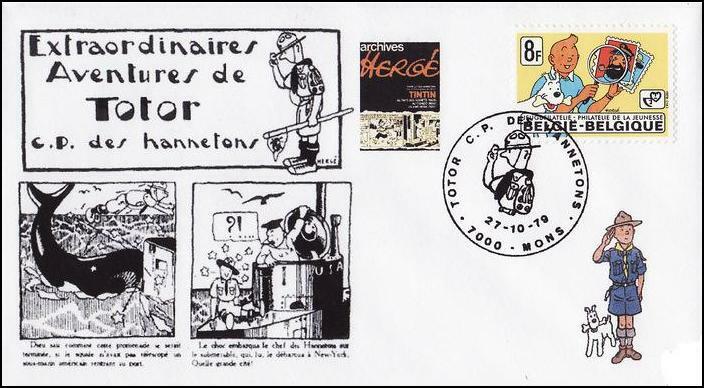 As mentioned above, the Boy Scout Patrol Leader Totor was Hergé's first character, so it was only appropriate that a second ceremony for the stamp took place at the BeNeLux Scouts Philatelic Convention on October 27, 1979 (Fig. 4). 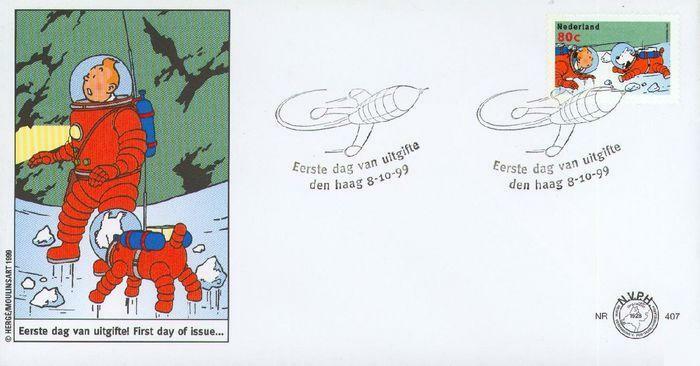 In 1984 to replace telegrams, Belgium Post introduced the “Postogram,” an express delivery type of product for the price of 50 francs, each one of which included an illustrated card. 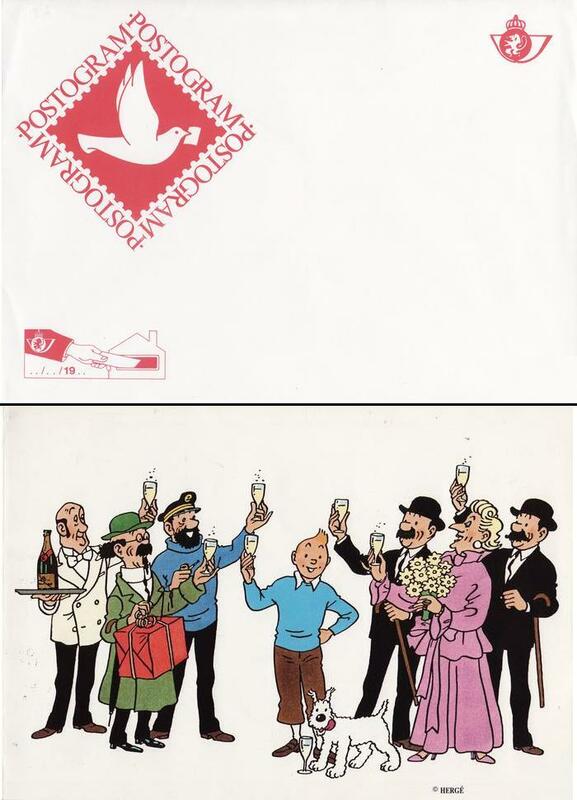 Often overlooked in Tintin philately was the 1991 Postogram illustrated with the Tintin cast of characters holding champagne flutes (Fig. 5). 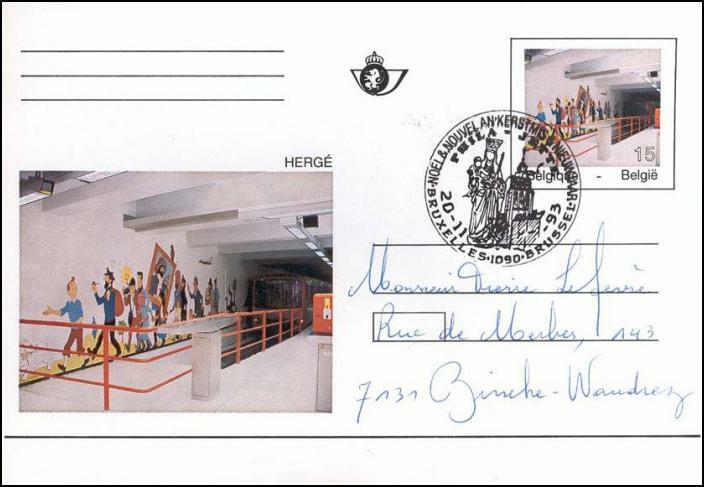 Also often overlooked was the postal card of a Brussels metro station issued October 16, 1993. 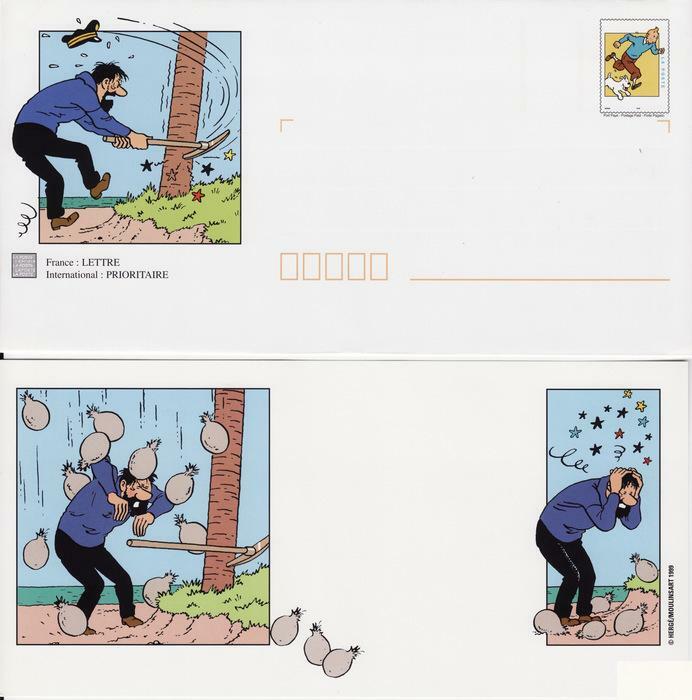 Pictured on both the card and the indicia is a mural designed by Hergé with a wide range of characters from various Tintin stories (Fig. 6). 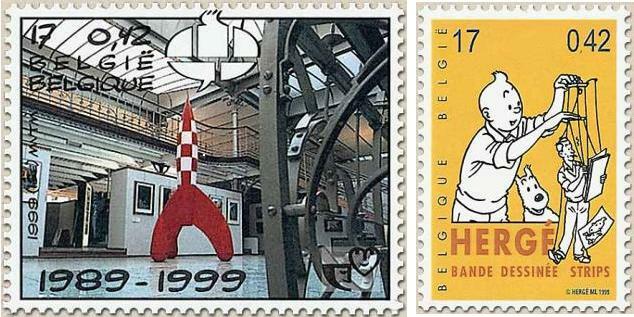 Dominating the entry hall of the Belgian Comic Strip Museum is a huge model of Tintin's moon rocket that carried Tintin and his friends to the moon in 1953, sixteen years before Neil Armstrong stepped onto the lunar surface on July 21, 1969. 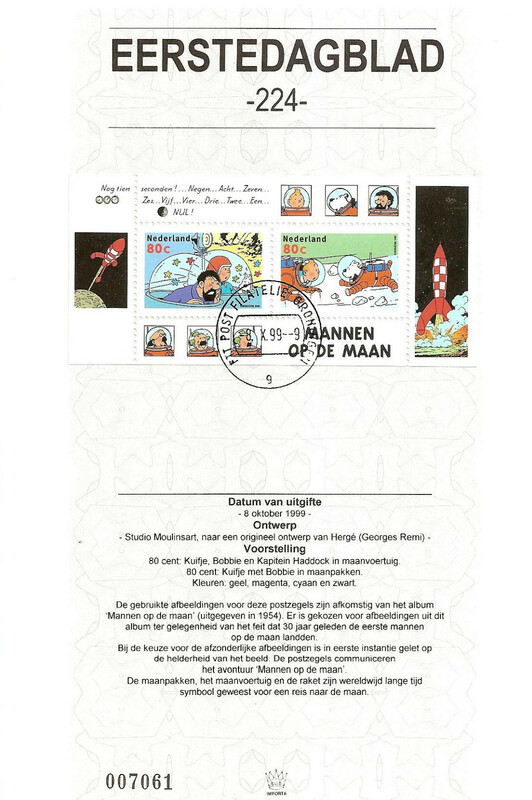 So it was only appropriate that the center stamp, Scott 1771e, of the nine-stamp block for the museum issued October 2, 1999 depict the moon rocket (Fig. 7). 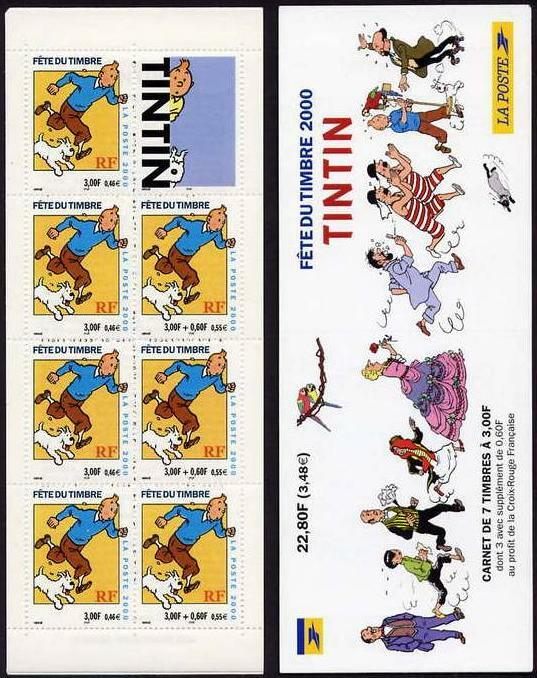 Two months later on Dec. 4, 1999, as part of the first of four 20-stamp mini-sheets called “A Tour of the 20th Century,” Hergé as a marionette being worked by Tintin, was the 19th stamp on the sheet, Scott 1779s (Fig. 8). First Day Covers of either of these 1999 stamps are next to impossible to find. 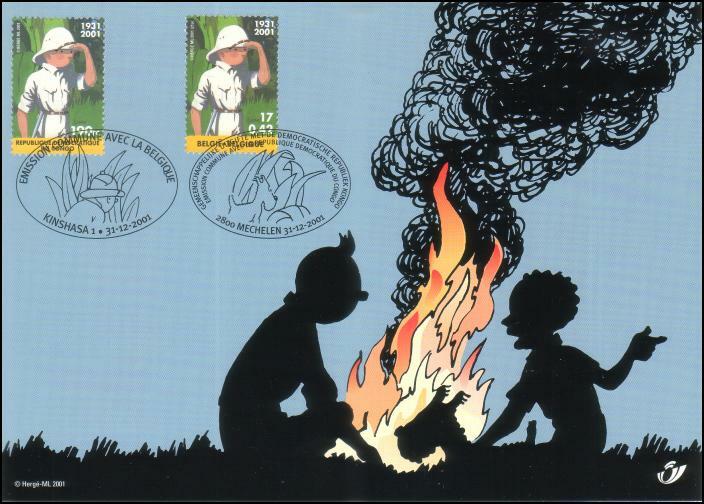 On the last day of 2001, Belgium and the Democratic Republic of the Congo jointly issued a stamp with Tintin in a pith helmet and a souvenir sheet with a single stamp in the center of Tintin driving with an African boy. 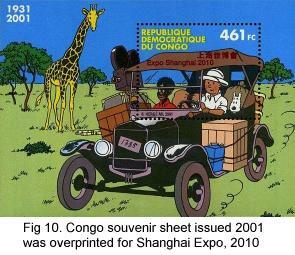 Tintin in the Congo was Hergé's second story and deemed by some people to be politically incorrect. 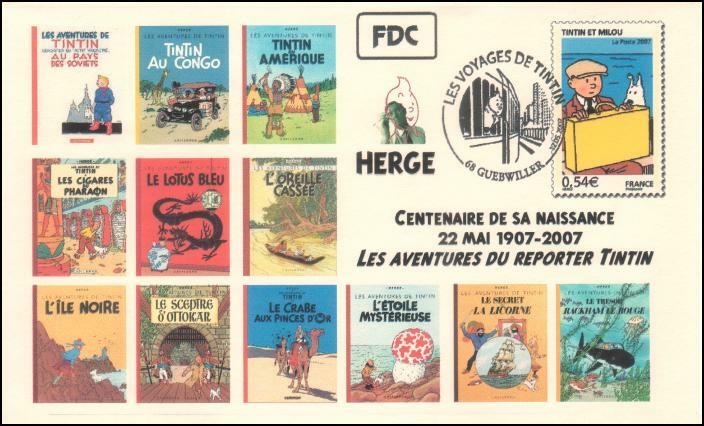 In fact, the book today is sold with a wide red sealing band around it stating, “Collector's Edition.” Obviously, the people in the Congo weren't the least bit offended if they were willing to participate in a joint stamp issue. 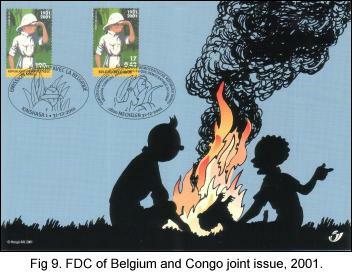 A nice piece is the official memorial card from Belgian Post with first day cancels of both stamps (Fig. 9). Both souvenir sheets had the same design, although the Congo one (Scott 1614) carried a quite high denomination of 461 Congolese francs, 2.4 times the value of single stamp (Scott 1613). 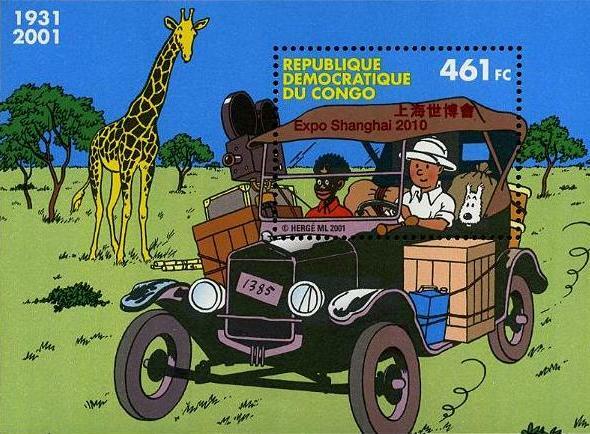 The country was so proud of the stamp and souvenir sheet that nine years later they overprinted them and sold them as souvenirs of their exhibit at the 2010 Shanghai Expo (Fig 10). 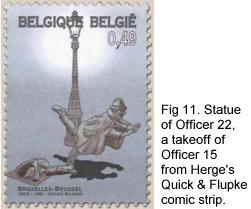 On July 5, 2003, in a series of five stamps picturing popular statues, a statue in Brussels by Tom Frantzen,De Vaartkapoen (Officer 22, a takeoff on Hergé's Officer 15 from the Quick & Flupke strip), Scott 1965, denominated at 0.49 €, was the fourth stamp in the group (Fig. 11). 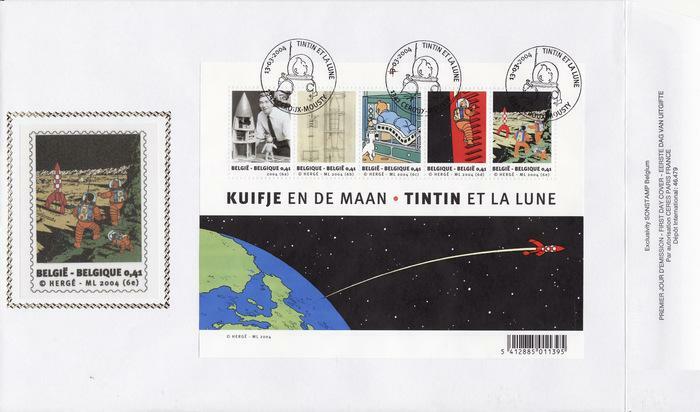 On March 15, 2004, Belgium issued asouvenir sheet of five stamps, Scott 2003, again honoring Tintin's popular lunar voyage, although the first stamp in the strip was a photo of Hergé himself (Fig. 12). 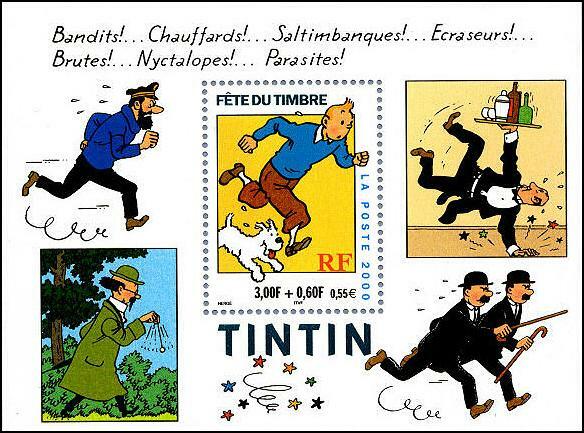 A year later, Quick & Flupke finally got their turn, but only as a black-and-white illustration from the strip, "A chacun son tour," on the left side of a stamped postal card of King Albert II produced for the Tintin Festival in Brussels on July 23, 2005 (Fig. 13). In September of 2005, a souvenir sheet of the Comic Strip Museum was jointly issued with Singapore, which we'll cover with Singapore. 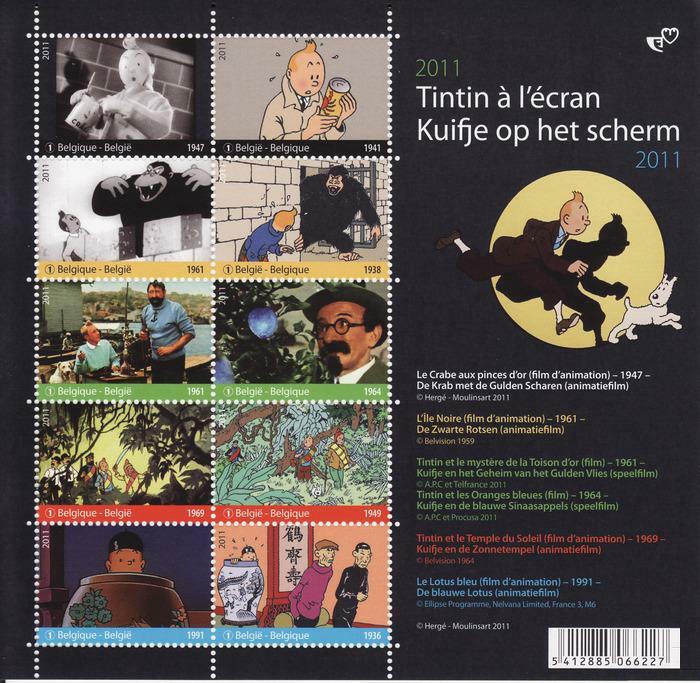 A full sheet of 25 stamps, Scott 2234, picturing all 24 Tintin book covers (in 24 languages!) 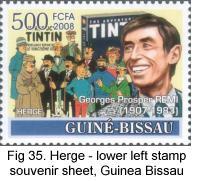 plus a portrait of Hergé was issued on May 22, 2007 for the 100th anniversary of the birth of Hergé (Fig 14). These stamps carried a denomination of 0.46 €. FDCs on maxi-cards picturing the book cover with the matching stamp are very attractive but becoming quite scarce. 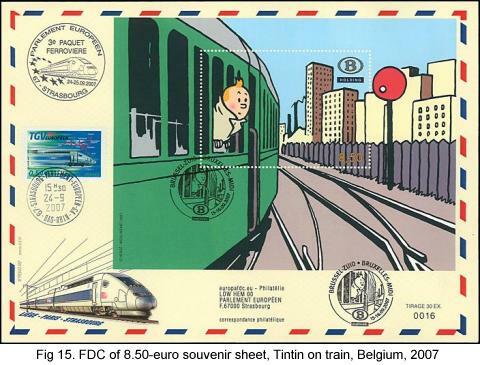 In September, 2007, Belgium Railways issued a Railway Letter Stamp souvenir sheet with a single 8.50-euro stamp showing Tintin on a train. 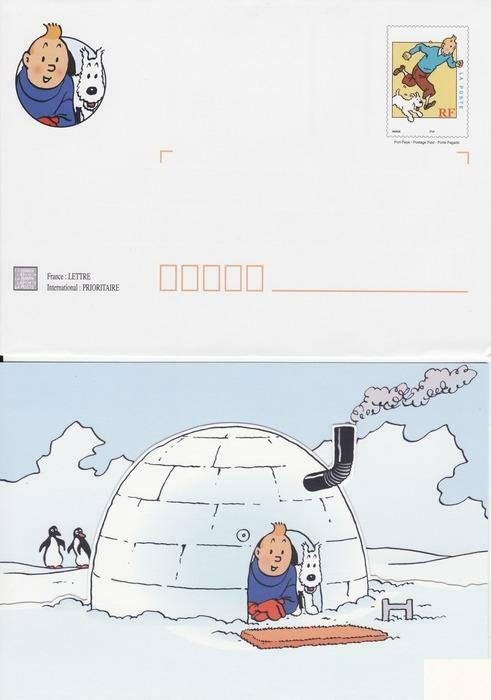 Along with its matching note card, this has become one of the most elusive Tintin items of all time. The earliest known usage on Sept. 15, 2007 was on three high-speed rail routes from Brussels, Antwerp or Liege to Paris and Strasbourg with a return journey on Sept 24, 2007. 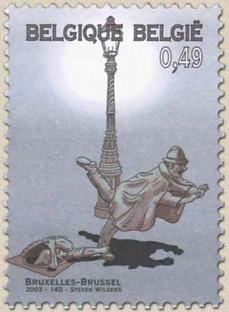 The cancel for the trip originating in Brussels matched the design on the stamp (Fig. 15). Continuing to garner attention, another souvenir sheet for the Comic Strip Museum, Scott 2399, was issued on October 5, 2009. 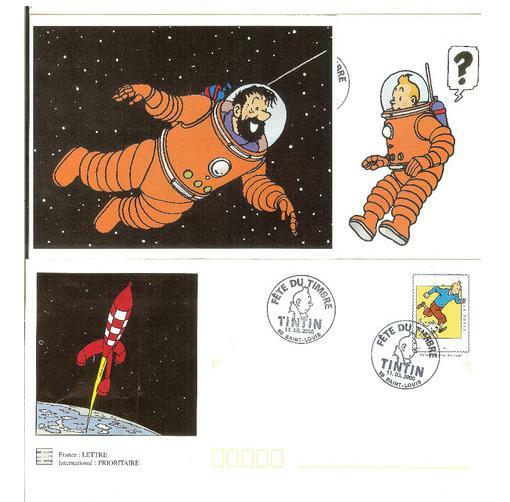 Tintin's moon rocket dominates the design and his distinctive swept back lock of hair is on the blank speech balloon on the stamp, but interestingly, no Hergé character appears on the sheet (Fig. 16). 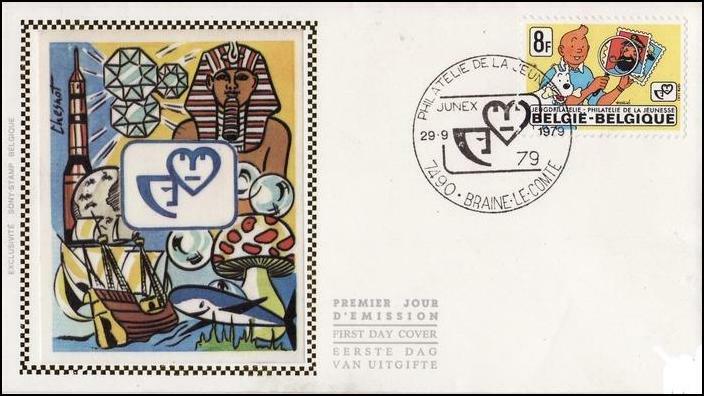 Although produced by Belgian Post, an FDC of the stamp alone is seldom seen. 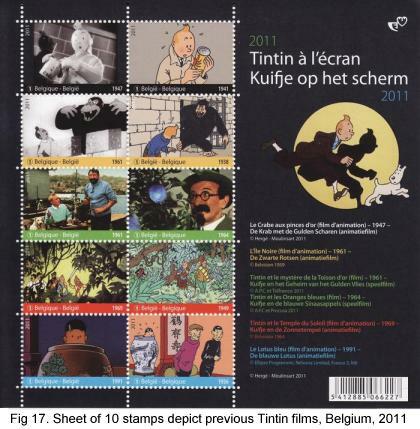 To debut the release of Spielberg's Tintin movie, a souvenir sheet of ten stamps picturing scenes from ten previous Tintin films was issued on August 29, 2011 (Fig. 17). 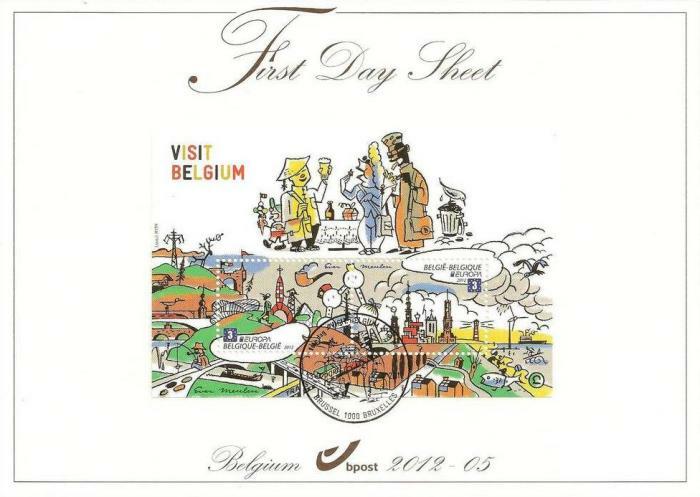 As part of the Europa omnibus issue, on February 13, 2012, Belgium issued a souvenir sheet of two stamps with the theme of Visit Belgium, Scott 2550. 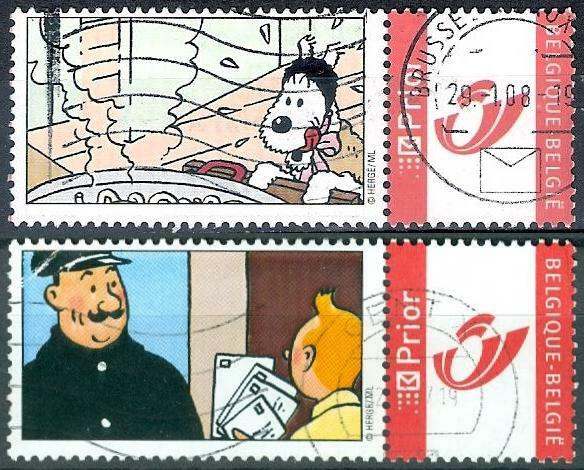 In the center isTintin's stylized face and on the left stamp is, yet again, Tintin's moon rocket (Fig. 18). 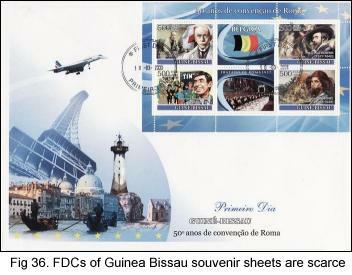 This souvenir sheet is on both an FDC and FDS. 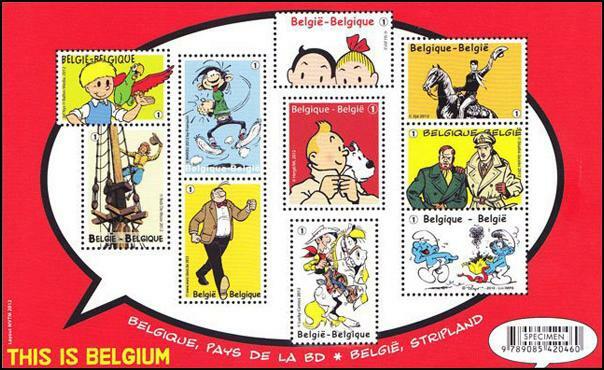 Later on September 17, 2012, Belgium issued a souvenir sheet honoring ten different comic strips, Scott 2591. 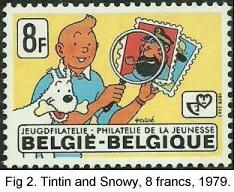 In the center, Tintin and Snowy have the place of honor on the sheet (Fig 19). FDCs of the stamp alone are quite scarce. 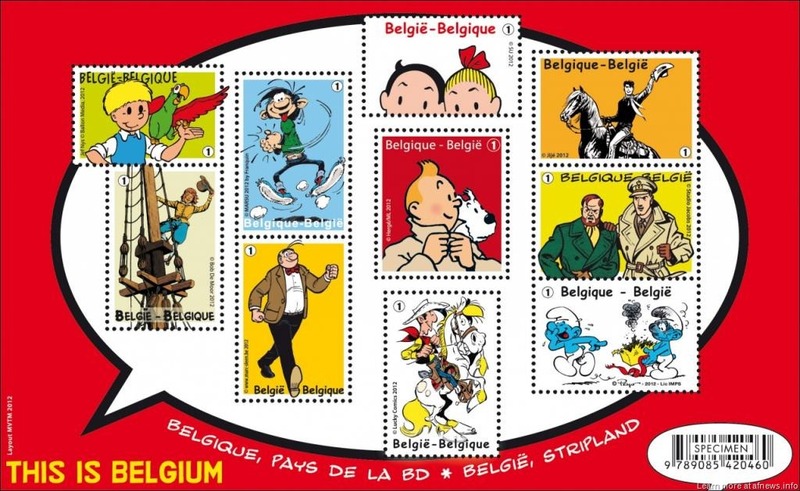 Starting in 2001 and continuing today, Belgium has been issuing “duostamps” for subjects such as movies, the New Year, Disney, flowers, animals, famous people, and comic book characters, like Tintin. 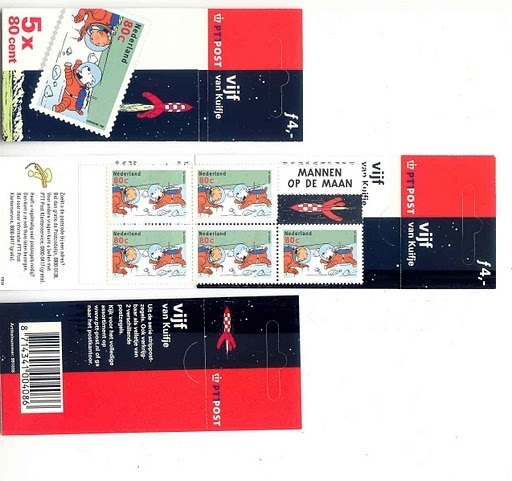 Each duostamp has a rectangular label with an image at the left and at the right a square stamp, usually in red and black with the Belgian Post symbol. A duostamp is good for the current letter rate, e.g., 0.49 € in 2007, however, they are priced at slightly more than twice the face value (4.99 € for a strip of five in 2007). The labels are not for personal images or photos as in the U.S., Canada, Australia, etc. but carry designs selected by Belgian Post. Approximately eight sheets with 5 designs per sheet are issued per year. Duostamps are produced in sheets of 15 (label plus stamp) and sometimes sold that way, but more often they are packaged in vertical strips of five in a plastic envelope. Some duostamps are released in conjunction with a special event (festival, museum opening, etc.) 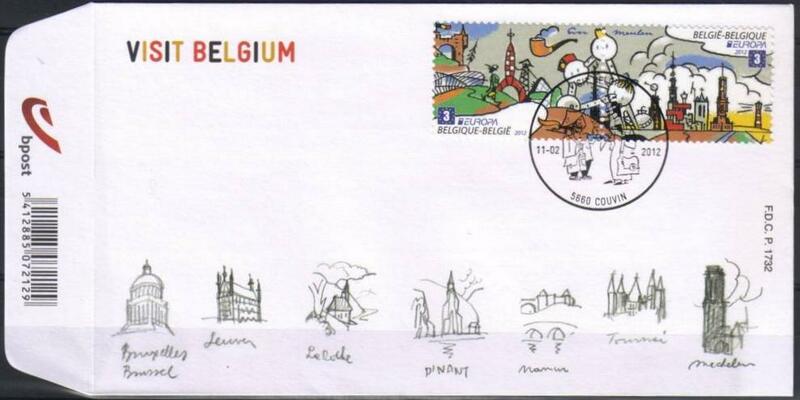 for which Belgian Post might have a special cancel but others are issued with little fanfare so First Day Covers per se do not exist. 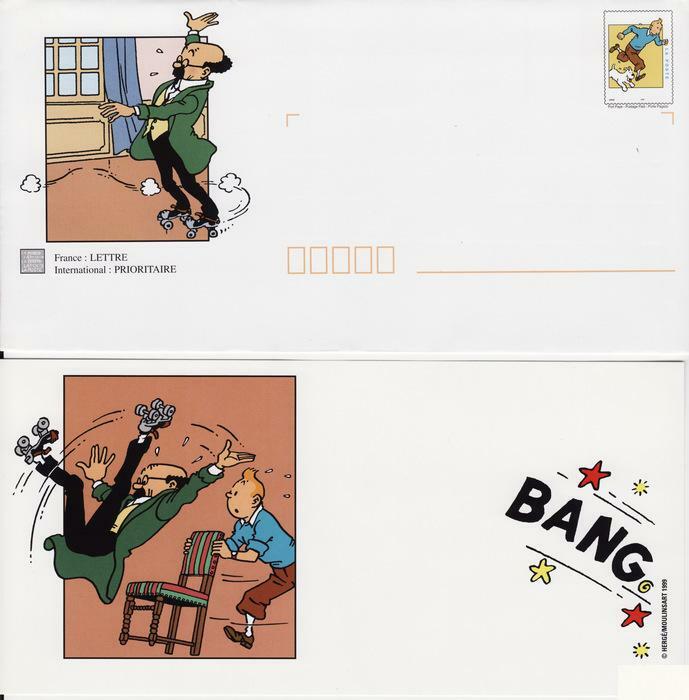 From 2001 through 2010, more duostamps have been issued for Hergé and Tintin than any other subject (at least 80 designs). 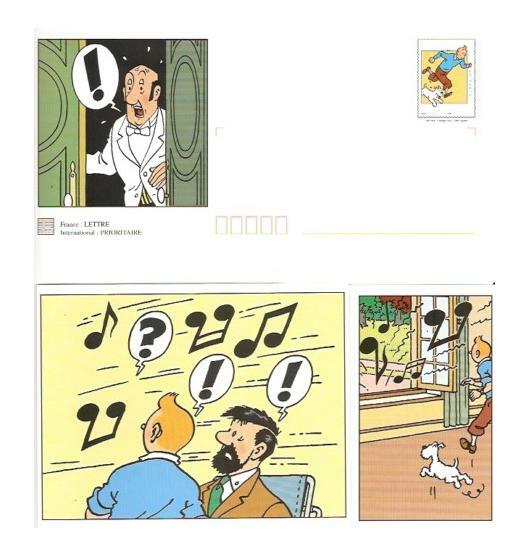 An interesting duostamp strip from 2008 pictured five of Hergé's comic strips: Totor, Tom and Millie, Quick & Flupke, Jo, Zette, and Jocko, and, of course, Tintin (Fig. 20). 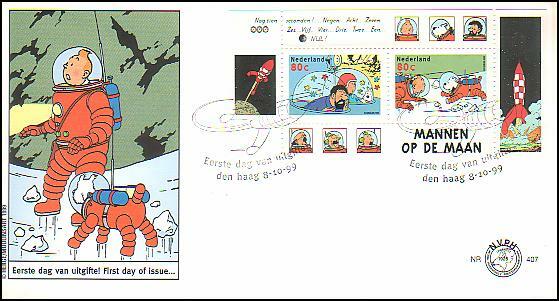 Click here to see images of some other duostamp strips: Anniversary | Automobiles | Character Portraits (15) | Dangers |Festivals | Flying Planes | Marine Scenes | Undersea | Thompsons | Scenes | Travel | Seated Travel | Tintin with Toys | Two Used Singles. Click on any image for a full-size image of the stamp or cover. 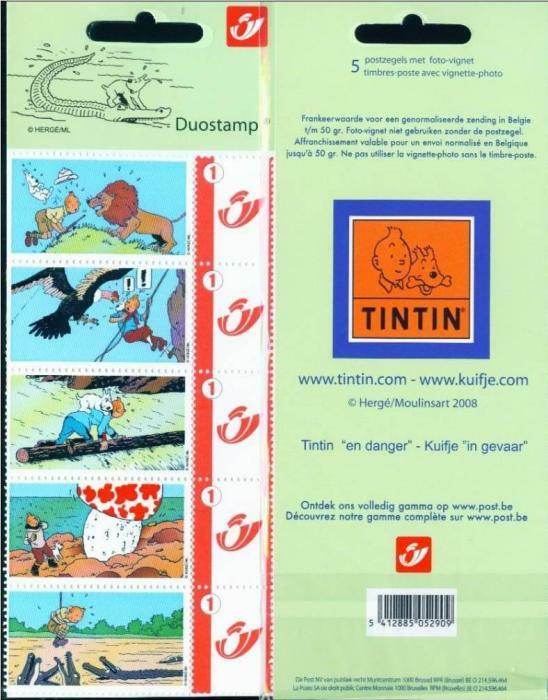 The Netherlands (Holland) being the northern neighbor of Belgium, and with the people in the north of Belgium speaking Flemish, a variety of Dutch, and with Tintin (Kuifje) being translated into Dutch early on, one would expect the Netherlands to be on the Tintin stamp bandwagon. 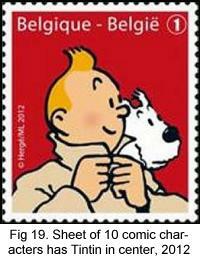 And, indeed, on October 8, 1999, they were the second country to issue a Tintin stamp. 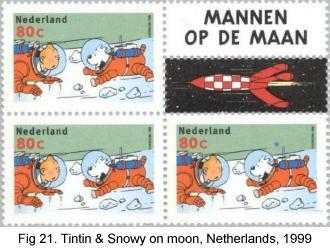 The issue was somewhat complicated consisting of a booklet of five stamps plus a double tab, Scott 1893b, which pictured Tintin and Snowy on the moon (Fig. 21). A second stamp, Scott 1893a, picturing Capt. 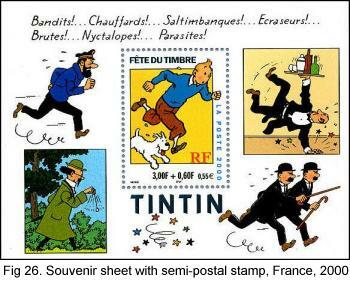 Haddock and Tintin, was coupled with the Tintin/Snowy stamp in a souvenir sheet (Fig. 22). Collectors and album producers seem to be divided as to whether to collect the two single stamps (one being removed from the souvenir sheet), or the souvenir sheet plus the booklet pane of five stamps plus tabs or a block of three plus tabs. 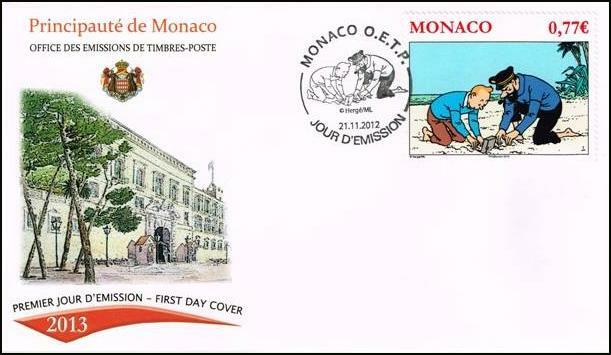 Many first day covers have been produced for theTintin/Snowy single stamp, Scott 1893b, the souvenir sheet on an envelope and the souvenir sheet on a page, but very few for the Haddock stamp, Sc 1893a. 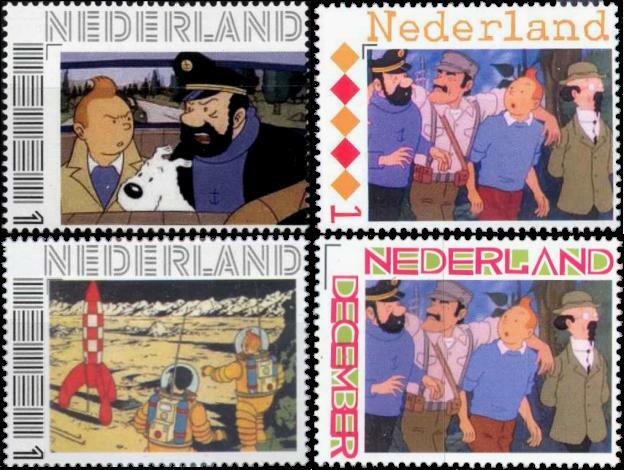 Like many other countries, the Netherlands offers personal postage stamps (Persoonlijke Postzegels) and at least one enterprising dealer (Collector World) furnished images for several high quality sets of Tintin stamps. These are sold today at usurious prices but, of course, are not official issues (Figs. 23). In France, starting in 1938, one day each year was designated as Stamp Day (changed to Stamp Festival in 2000). 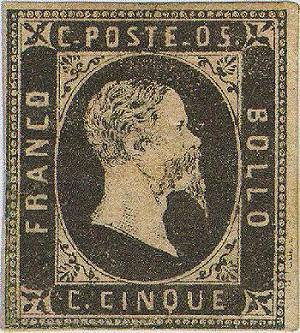 Since December 1944, La Poste (French Postal Service) has issued a stamp on that day which, until 1999, focused on French postal history. However, starting in 2000 the subjects have been ones deemed to be attractive to young collectors, mainly stories or comic book heroes. An interesting aspect of the event is that it takes place throughout the country in every town and city with an active Philatelic Association. 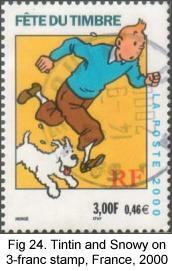 In the year 2000, Tintin and Snowy running together was the single design for a new stamp (Fig. 24), but the issue was incredibly complex. The basic stamp with a value of 3.00 francs (0.46 euros), Scott 2764, was issued in panes of 40. A booklet of 7 stamps was also issued with the four stamps on the left side of the pane being denominated at 3.00 f and the three on the right being semi-postals of 3.00 f + 0.60 f to benefit the French Red Cross. 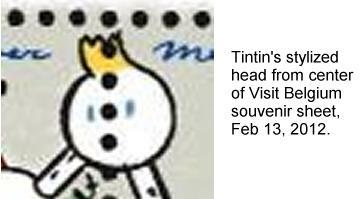 The eighth position in the booklet was a tab simply reading "Tintin." Thus, perhaps the most desirable First Day Cover has become one with the stamp and tab from the top of the booklet (Fig. 25). 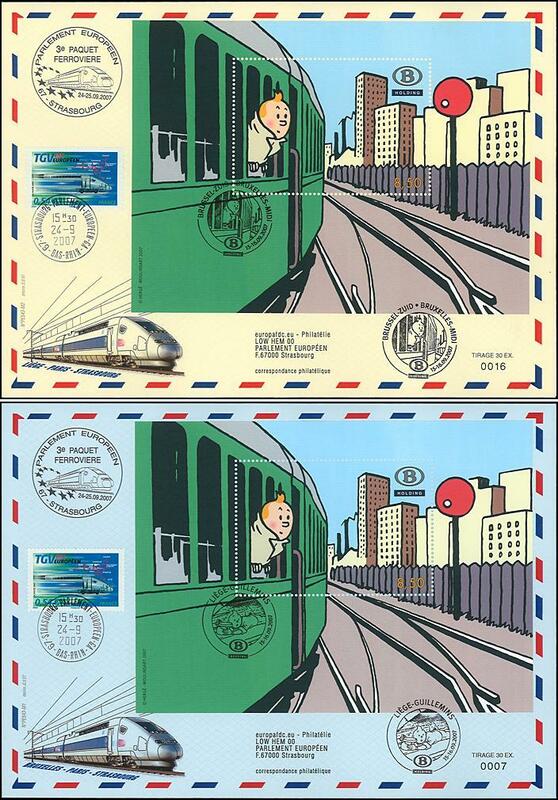 In addition, a souvenir sheet with the semi-postal stamp was issued (Fig. 26). 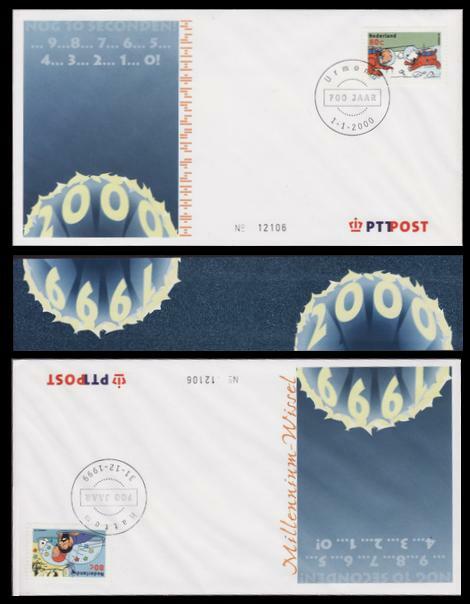 And if that weren't enough, ten matching stamped envelopes were issued from 2000 to 2003, in two sizes with designs on both the front and insert (Fig 27). 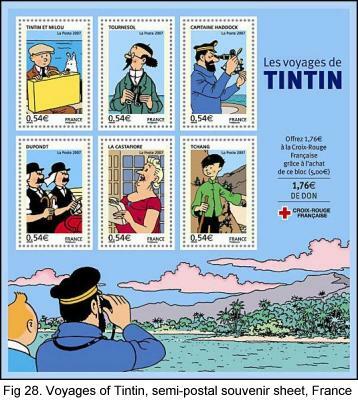 Jumping the gun a bit on 100th anniversary of Hergé's birth, on May 12, 2007, France issued six stamps called The Voyages of Tintin. 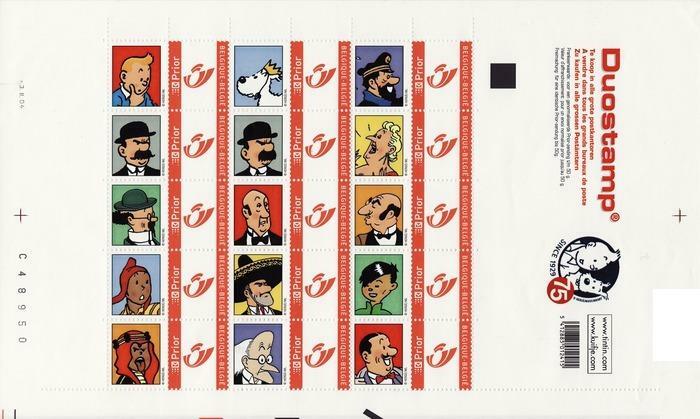 This suggests the stamps represent different stories, which they might, although they actually depict six different characters that appear in many Tintin stories. Denominated at 0.54 euros, these were issued in sheets, Scott 3329-34, as well as all six in a single souvenir sheet (Fig 28). Some towns in France are rather lenient with the use of canceling devices at the Stamp Festivals and thus one can find covers with first day or festival cancels on fake stamps, cinderellas, labels, or even nothing at all popping up for sale. One should be especially cautious of covers coming from Guebwiller or Illzach, Alsatian towns near the border of Germany and Switzerland. Covers labeled “Centenaire de sa Naissance d'Hergée - 2007” from Guebwiller or “Bedecine 2000” from Illzach , even if they are also labeled “FDC” are almost all fakes (Fig. 29). 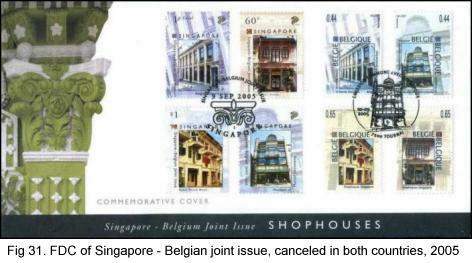 As mentioned above, Singapore had a joint issue with Belgium on September 9, 2005, of four stamps depicting similar “shophouses” in both countries, two in Brussels and two in Singapore. The stamps were issued both in sheet form and as a souvenir sheet with all four stamps, Scott 1160a. 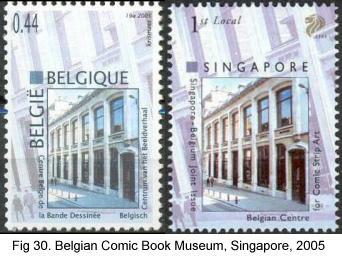 The lowest value stamp for the basic letter rate (23¢) carries the notation “1st Local” in Singapore and has an image of the Belgium Comic Strip Museum (Fig. 30). 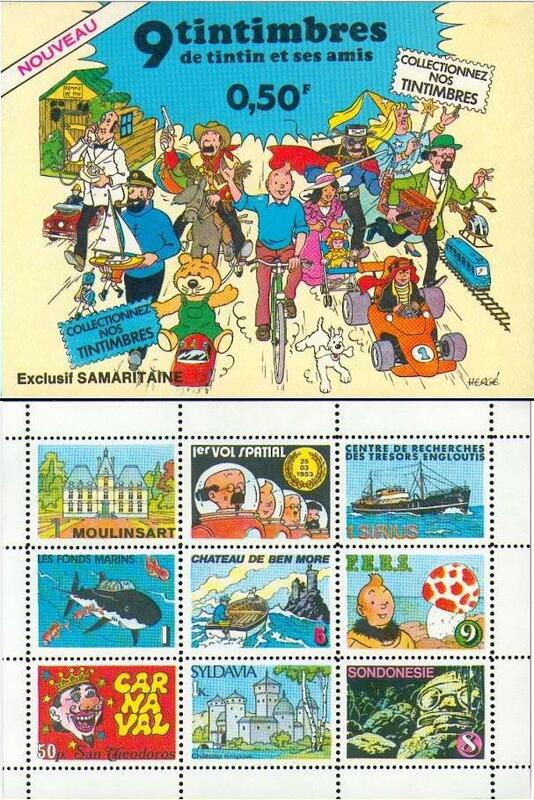 On a souvenir sheet of 8 stamps and 8 labels, several labels are scenes from Tintin stories. The corresponding Belgian issue, Scott 2104, which came out a day later on Sept 10, was issued only in sheet form, two with the value of 44 francs and two valued at 65 francs. 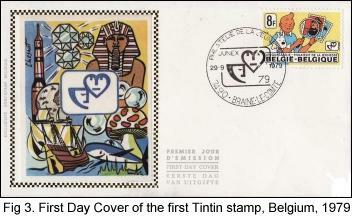 A very nice piece is an oversize First Day Cover with all four stamps from both countries (Fig. 31). 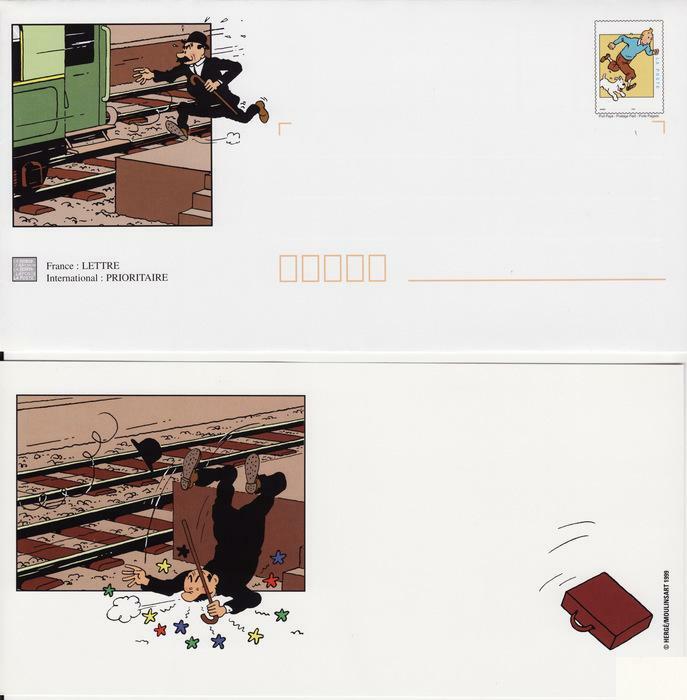 As with France, jumping the gun a bit, Switzerland issued two stamped picture postcards in Geneva on May 10, 2007 in honor of the 100th anniversary of Hergé's birth. A vertical design pictured the Hotel Cornavin with Tintin and Haddock walking up the steps. A horizontal design pictured a Swissair bus in front of the Hotel Beaujolais. First Day of Issue (Jour d'emission) cancels were provided in Geneva on May 10. Pictorial cancels were also offered for L'Afere Tournesol (The Sunflower Affair) in Bulle on May 22, 2007 and at the Tintin Festival in Lausanne on July 7-8, 2007 (Figs. 32-33). 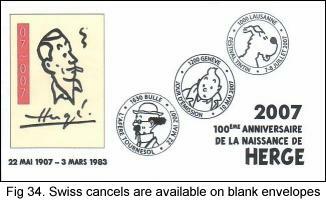 As with their neighbor, France, Switzerland makes cancels available on almost anything, blank envelopes included (Fig. 34). A former Portuguese colony, Guinea Bissau is a tiny, incredibly poor nation sandwiched between Senegal and Guinea on the west cost of Africa. To earn some foreign exchange, they happily issue postage stamps for collectors, most of which will never see anything but a stamp album. 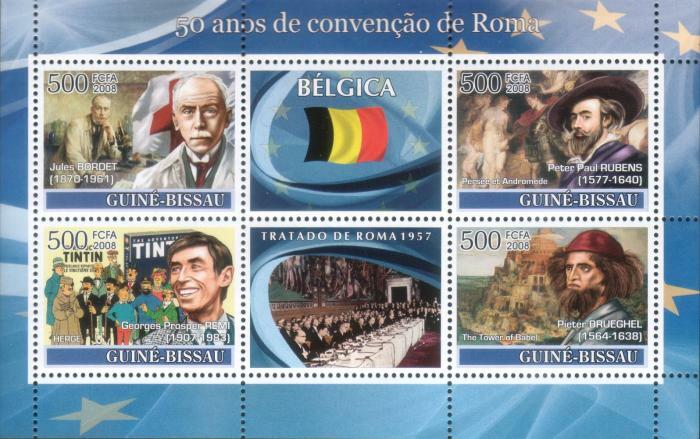 Thus on March 10, 2008, they issued a colorful souvenir sheet of four stamps and two labels (Michel 3744-47) honoring the 50 year anniversary of Belgium signing the Treaty of Rome. 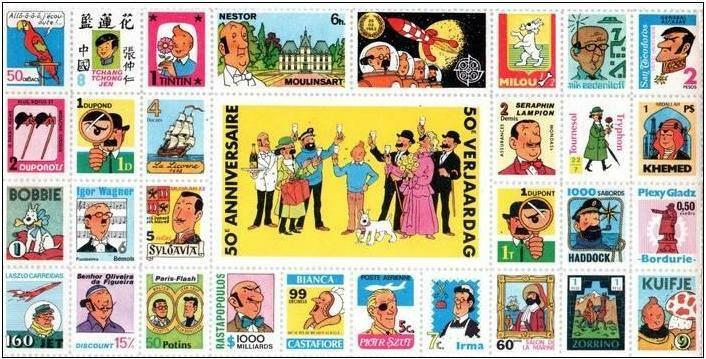 Featured on the sheet are the Nobel Peace Prize winning microbiologist Jules Bordet, the Baroque painter Peter Paul Rubens, Renaissance painter Pieter Bruegel, and our friend Georges Remi, aka Hergé along with a number of his Tintin characters. 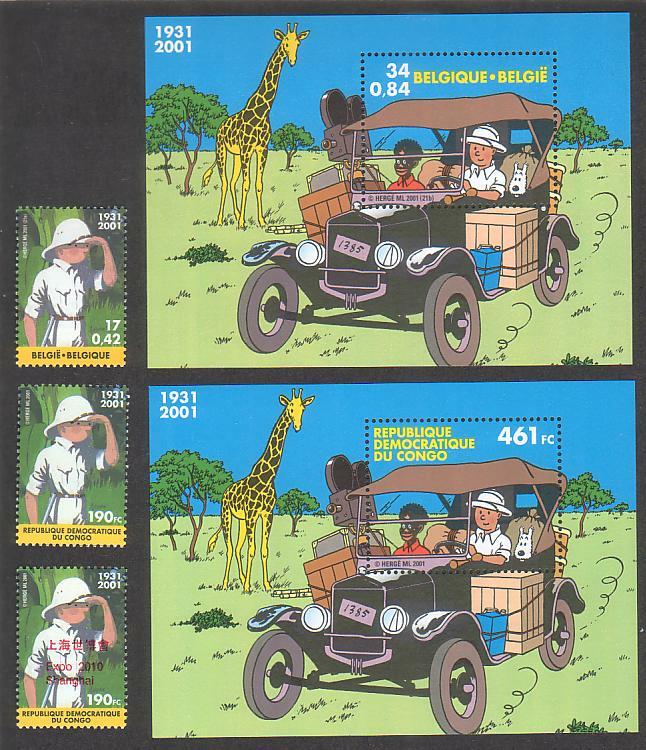 Alas, Guinea Bissau had not gotten permission to use these copyrighted figures from Studios Hergé who came down on them like a ton of bricks and forced them to remove the bottom left stamp and sell the resulting sheet of three stamps and two labels. There are still some intact sheets around (Fig. 35), however, they command a premium price over the "official" mutilated sheet. A First Day Cover of this souvenir sheet is especially elusive; grab it if you see it (Fig. 36). The largest country in Africa, Algeria (officially the People's Democratic Republic of Algeria) won its independence from France in 1962 after a bloody 8-year campaign of guerrilla warfare. What comes after independence? Home- grown comics, of course, which were first published in 1967 in the weeklyAlgeria News and then, in 1969, in the newspaper El Mujahid, one of the oldest and best known papers in the Arab and African world. 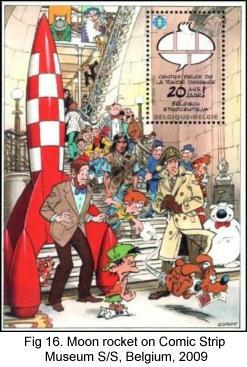 Until then people in Algeria had been enjoying comics from the French-speaking world like Spirou, Asterix, The Smurfs, and, of course, Tintin. Needless to say, these earlier French comics, and especially Tintin were a great influence on the young Algerian artists. 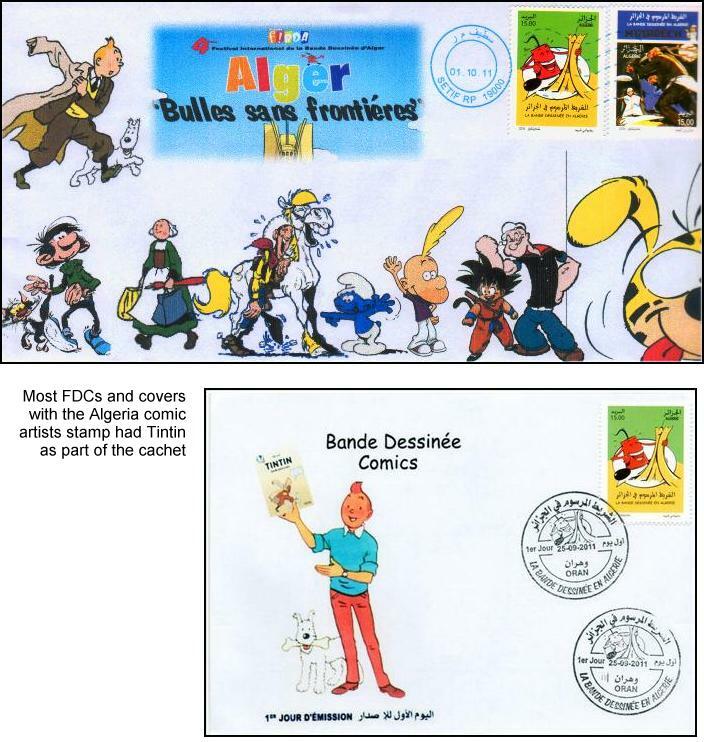 Forty some-odd years later on September 25, 2011 at the 9th Algerian Arts Festival a pair of stamps was finally issued to honor Algerian comic book artists. 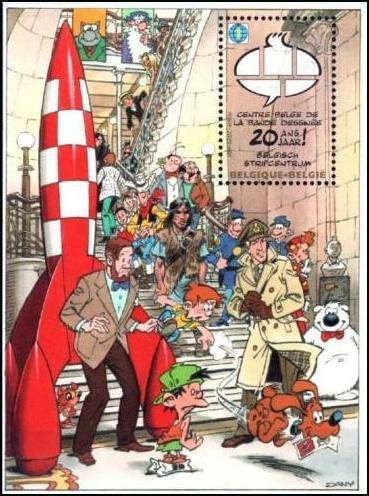 What was a bit surprising was that the vast majority of First Day Cover cachetsincluded Tintin, either alone or as part of the design (Fig. 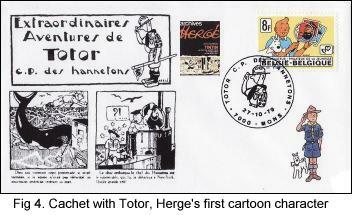 37) thus recognizing Hergé's continuing influence on the comic art of the country. The Principality of Monaco, a sovereign city state located on the French Riviera, is the second smallest and most densely populated country in the world. On November 21, 2012, the Casterman publishing house released the third installment of the Adventures of Tintin in the Monégasque language. (Monégasque, along with other Ligurian languages, is derived directly from northern Italian languages of the Middle Ages. It is spoken in the old part of Monaco, taught in schools, and street signs are marked in Monégasque in addition to French.) The third Tintin book in Monégasque called “U Tesoru de Rakamu u Russu” (Red Rackham’s Treasure) follows “I Ori de Castafiore” (The Castafiore Emerald) and “U Secretu d’a Licorna” (The Secret of the Unicorn). 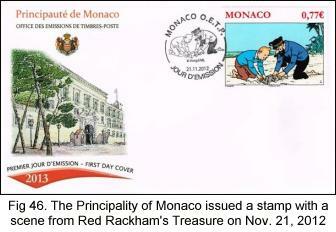 To commemorate this event a stamp created in collaboration with Moulinsart, was issued by Monaco on the same day. 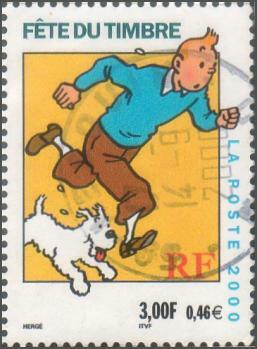 The stamp depicts Tintin and Capt. Haddock digging up the remains of the “jolly boat” on which Sir Francis Haddock came ashore on the island. This scene appears on the bottom left of page 25 of the book, Red Rackham's Treasure. 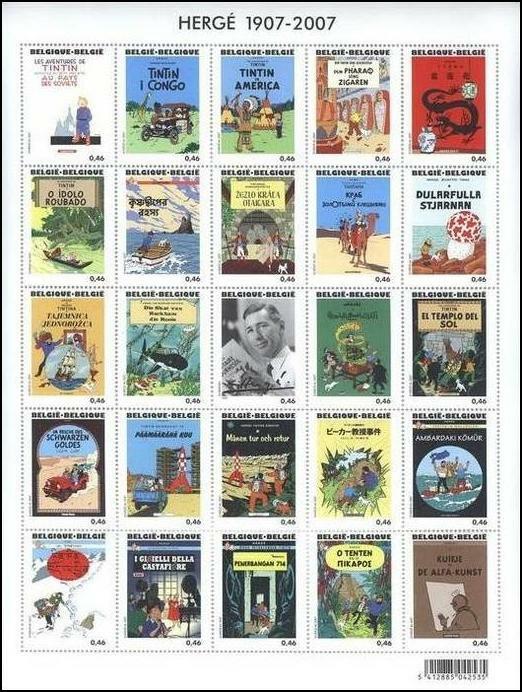 Concurrent with the release of the Tintin movie in 2011, about 150 different stamped postcards suddenly appeared from China with images of book covers, stills from the movie, and portions of book pages printed on the back of standard 80-yen (domestic rate) stamped postcards (Fig. 38). China Post prints scores of picture postcards each year, but these Tintin cards of apparently pirated images seem to be the work of four or five enterprising vendors in the People's Republic. They are marketed heavily in Europe on the Delcampe auction web site and tend to sell for rather outrageous prices of 2 to 3 euros each. A vendor in India also produced an unknown number of postcards with designs printed in rather poor quality on the left side of the address side of the card priced at a usurious 3.99 euros each (Fig 39). A side note: it was EuroBooksIndia of Mumbai that in 2008 published the first English translations of the 11 Quick & Flupke books by Hergé, which are still not available in the rest of the world. 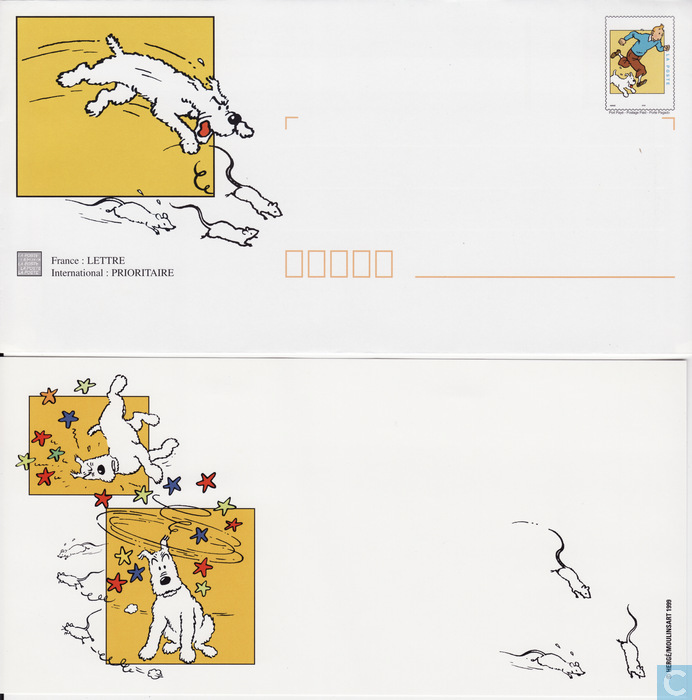 In conjunction with an International Comic Strip Salon (Exhibition), Romania issued a 50-bani domestic mail envelope on October 13, 2005 with a colorful illustration on the left picturing many comic strip characters along with Tintin’s moon rocket taking off from their midst (Fig. 40). There are no known FDCs of this piece. 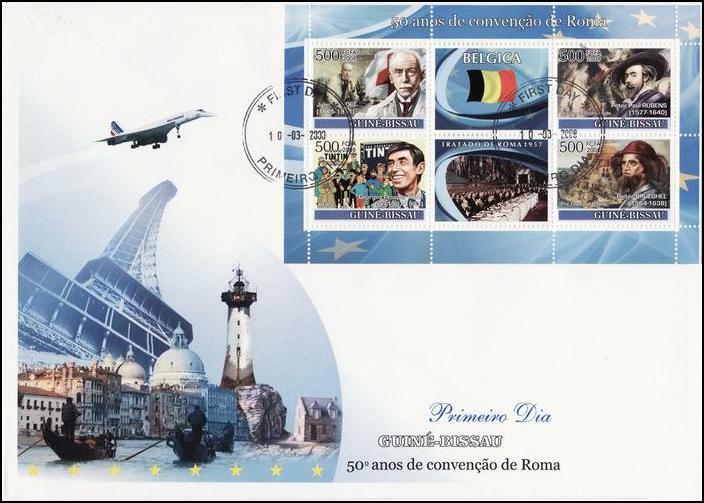 Angola, a country in southwest Africa, also issues hundreds of thematic stamps. But in addition, Stampdile Ltd of the UK produces totally illegal Angola stamps including, in 1999, a series of 4-stamp sheetlets under the banner, Countdown to the Millennium. 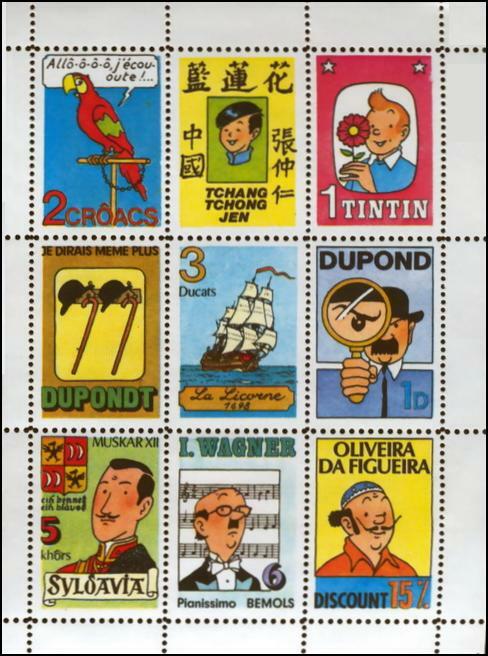 The upper right stamp in the sheet covering the decade 1920-29 pictured Tintin, but of course the stamps are postally invalid (Fig. 41). Another excellent quality but totally fake souvenir sheet was probably also produced by Stampdile in 2004. The text on the sheet in is Russian and reads, loosely translated, "75 Years of the Belgian Hero in European Comic Books, Tintin" (Fig. 42). Some on-line sellers are optimistically pricing this fake souvenir sheet at almost $70.00! 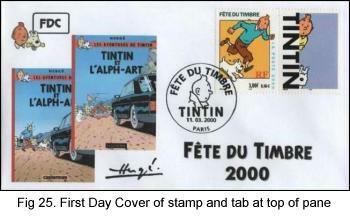 Over the years, stamp-like labels have been produced as chocolate bar wrappers, promotional items, and just as label sheets to sell to Tintin enthusiasts. Perhaps the best quality labels were produced in 1979 by an unknown printer for the 50th anniversary of the first appearance of Tintin in print. These very clever labels were produced to look like stamps and were produced in three sheetlets of nine each and also, with some slight revisions, in a large sheet of 28-stamp-size labels plus two double-size ones around a central large label reading, "50th Anniversary" (see Fig. 43 above). 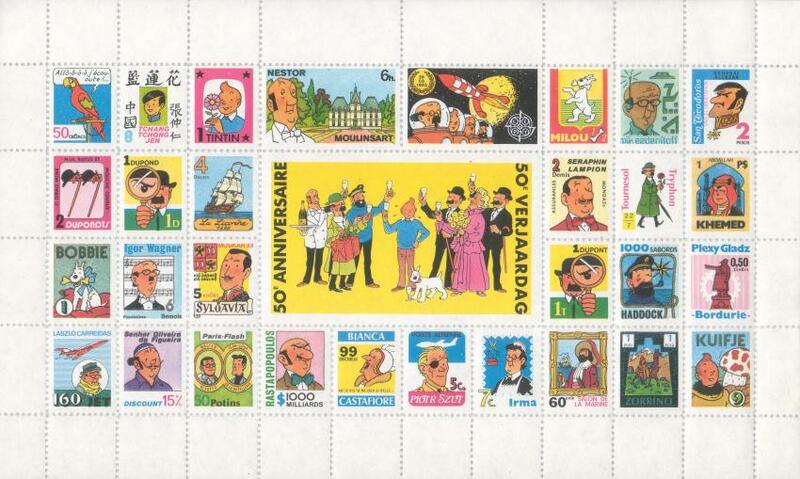 Four similar sets of nine labels in a horizontal design called “Tintin and Friends” were also produced in France in 1979 and sold for 0.50 francs per set by the Samaritaine department stores. Another group of at least ten stamp-like labels in Arabic were produced in 1958-60 in Egypt (Fig. 44). A sheet of labels was periodically included as a bonus with the comics magazine Samir. 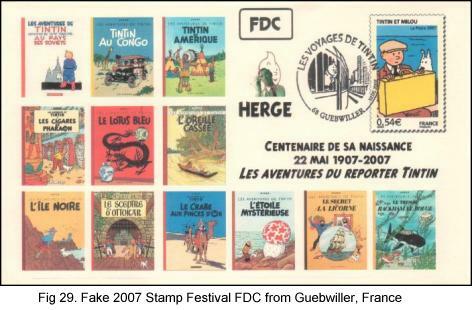 Finally, many other fake Tintin stamps abound. 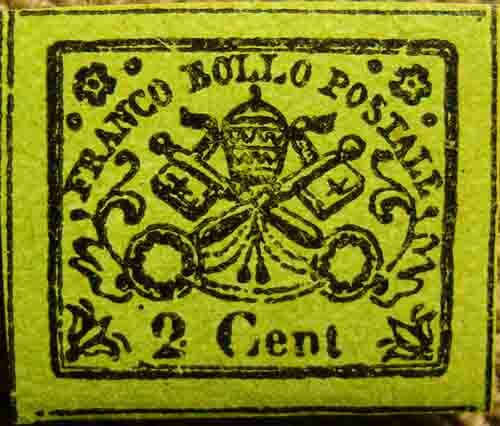 A 2004 article by Roland Francart in Philabulle lists more than 40 faux stamps in 9 separate issues, and the number has probably doubled since then. 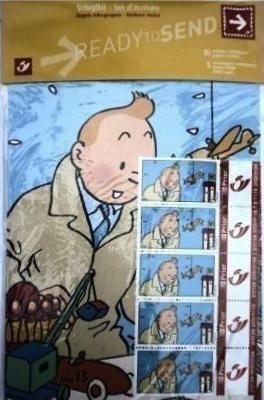 Tintin collectors: have fun but be careful. 1. 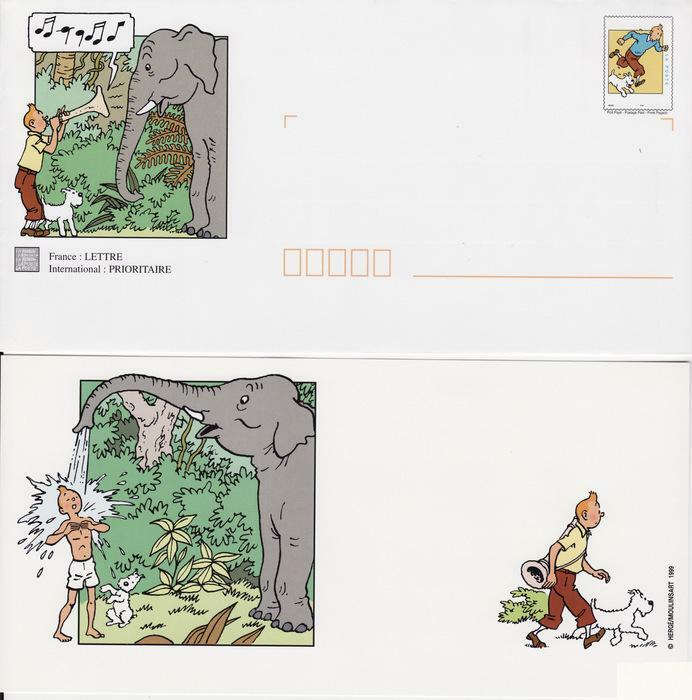 All Hergé (Almost) in Philately, Roland Francart, Philabulle (Quarterly Bulletin of Friends of Philately), May 2004, Belgium (French language). Also updated article, same title, May 2007. 2. 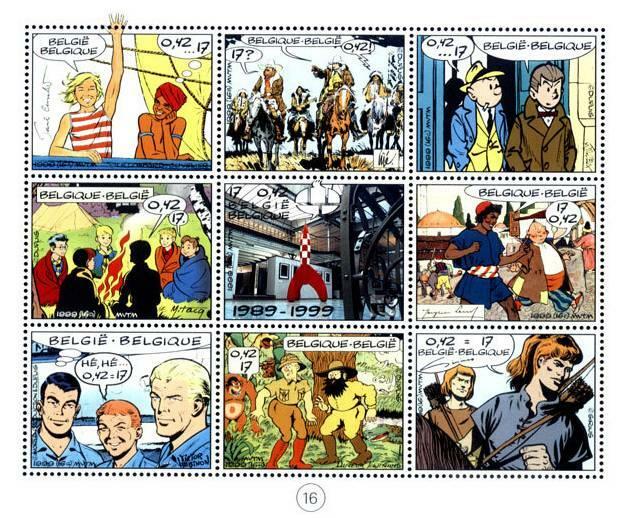 Belgian Comic Hero Stamps - Alix to Zorglub, Roland Francart, Philabulle, December 2010, Belgium. 3. Illegal Stamps: Philately's Rough Trade, J. M. Chute, Association of Philatelic Web Publishers (Internet article), 6/21/02. A life member of the APS and AFDCS, David Ahl has been collecting and exhibiting stamps and covers on a wide range of topics since World War II. He founded the first personal computing magazine, Creative Computing, in 1974 and has written on subjects from the Bible to global investing and from military vehicles to New Zealand. Wander around on his wild web site at www.SwapMeetDave.com." Neto de húngaros por parte de pai, sou paulistano, nasci no Hospital e Maternidade da Lapa* às 5 horas (4h45), do dia 2 de agosto de 1964 (ano bissexto e da Revolução); ou no ano MCMLXIV no calendário gregoriano. Em outros calendários corresponde: 5724 – 5725 (hebraico) e 1384 – 1385 (islâmico). * Peso: 4,350 kg (4,340 kg ao sair do hospital). Estatura: 52 centímetros. Parto: Normal. Parteira: Esperança. Pediatra: Dr. Dante Fontanesi. Estas foram as Condições de Nascimento segundo cartão da Seção Berçário do Hospital e Maternidade da Lapa, hoje, Hospital Metropolitano, localizado na Rua Marcelina, 441 – Vila Romana, Lapa. Em 03/10/1945, foi fundada a Maternidade da Lapa. Em 1951, a Maternidade da Lapa passou a se chamar Hospital e Maternidade da Lapa S.A. Alguns anos após o meu nascimento, em 1971, mudou o nome para Hospital Mater Dei. Em 1989, foi constituído o Hospital Metropolitano S.A. (hospitalmetropolitano.com.br). No mesmo ano, 1964, nasceram: Patrícia Pillar (11/01, atriz), Michelle Obama (17/01, primeira-dama dos Estados Unidos), Juliette Binoche (09/03, atriz francesa), Aurélio Miguel (10/03, ex-judoca e político), Maurício Mattar (03/04, ator), Keanu Reeves (02/09, ator norte-americano, nascido no Líbano), Monica Bellucci (30/09, atriz e modelo italiana), Alexandre Frota (14/10, ator e modelo), Marcelo Duarte (31/10, jornalista e escritor), Roberta Close (07/12, modelo). Portanto, assim como eu, todas essas pessoas são do signo de Dragão, no horóscopo chinês. Morreram as brasileiras: Anita Malfatti (02/12/1889-06/11/1964, pintora, desenhista, gravadora e professora brasileira) e Cecília Meireles (07/11/1901-09/11/1964, poetisa, pintora, professora e jornalista brasileira). O Ensino Fundamental (1ª, 2ª e 3ª séries) e Médio (5ª, 6ª, 7ª e 8ª séries) completei no GESC Romeu de Morais, como era chamado à época (como mostra a fotografia recordação abaixo), hoje, Escola Estadual de Primeiro Grau Romeu de Moraes (eeromeudemoraes.net), de 1971 a 1977; fundada em 1938, está localizada na Rua Tonelero, 407 – no bairro de Vila Ipojuca, zona Oeste de São Paulo. Eu morava na mesma rua da escola, em frente a matriz da Paróquia São João Batista Vila Ipojuca (criada em 25/01/1940), cuja igreja começou a ser construída em 10/07/1950, substituindo uma antiga capela... Penso que ela deve ter sido inaugurada no dia 24 de junho – dia de São João Batista, seu patrono (protetor, defensor e padroeiro), autor do 4º Evangelho e do Apocalipse. Nesta igreja, localizada na Rua Tonelero, 967 – Vila Ipojuca, eu fui batizado, mas a Primeira Eucaristia ou Primeira Comunhão eu fiz na igreja da Paróquia São João Maria Vianney (padroeiro dos párocos; festa 04/08), situada na Praça Cornélia, 135 – bairro Água Branca (Setor Lapa), em 25/10/1975. A fotografia em branco e preto datada de 09/08/1964 (sete dias após o meu nascimento, segundo a Lembrança do Batismo), foi tirada pela antiga Foto São João Batista (Rua Tonelero, 962 – Vila Ipojuca), cuja imagem mostra, da esquerda para à direita, o primeiro Pároco de Vila Ipojuca, Padre Walter Schewiora (designado oficialmente em 07/12/1941), meu pai, minha mãe e meus padrinhos de Batismo:Irene Sakall e Luiz Antonio Bruna. Em 24/02/1979 mudamos de residência pela primeira vez... Da Vila Ipojuca fomos para outro bairro: Pirituba. Como a maioria fui office-boy, empregado no Cartório de Registro Civil das Pessoas Naturais do 31º Subdistrito da Capital – Pirituba (Avenida Mutinga, 201), instalado em 23/08/1936. Assim como auxiliar de escritório na Metal Pó – empresa em que fui admitido no dia 20/06/1979. Também fui bancário no extinto Banco Bamerindus (admitido em 02/05/1984), modelo fotográfico e manequim (de 1985 a 1986), após ter servido ao Exército, no 39º BIMTZ – Batalhão de Infantaria Motorizado, localizado na Avenida dos Autonomistas s/nº, no bairro de Quitaúna, cidade de Osasco – SP. Incorporação Militar: 03/02/1983. Licença Militar: 29/02/1984. Já “liberto”, durante alguns anos trabalhei como vendedor, decorador, vitrinista e arranjador em lojas de decoração, uma no Shopping Ibirapuera*, zona sul de São Paulo (1986), e outra no interior do Estado, Sorocaba (18/05/1987); onde fiz muitos amigos, entre eles José Honório Ferreira Paes (nascido em 09/07/1963, às 10h30) e a morena Lídia Peredo (nascida em 10/07/1966, às 12 horas; que atualmente está loiríssima no facebook.com/lidia.peredo... rs); depois conheci Paulo. Em seguida, tive a minha própria floricultura no Tatuapé, onde adquiri vasta experiência em dar formas a arranjos florais, tanto nos naturais como em artificiais. * N. P. Presentes e Decorações Ltda., de 01/03/1986 a 30/09/1986, cuja matriz estava localizada na Avenida Vieira de Carvalho, 179/185 – Vila Buarque, Centro, e a filial era no Shopping Ibirapuera, Avenida Ibirapuera, 3103 – piso 1, loja 73 – Moema. Nota: Período em que adquiri “as palatniks”. A pequena imagem acima mostra o meu 1º cartão de visita impresso em papel cartão branco com frente de cor preta e letras em verde brilhante: “Sérgio Eduardo ~ Flores, R. Cantagalo, 427 ~ Tatuapé ~ Cep. 03319, Próx. Pça. Sílvio Romero”. Abaixo, desenhos a lápis de vários arranjos artificiais de mesa, chão e teto, elaborados com plantas desidratadas, em seda, entre outros acessórios. Exerci durante nove anos um trabalho de auto-análise, orientação e previsões nos campos da Psicologia, Psicanálise e Filosofia de vida. Exímio (ex) jogador do Oráculo das Runas, sempre procurei de uma maneira prática auxiliar o consulente através de seu autoconhecimento. Fiz vários cursos de Numerologia, Astrologia e Tarô, abrangendo todas as suas possibilidades, principalmente, a arte de aconselhar e orientar. No segundo semestre de 2012, joguei fora dois certificados de participação que eu tinha em arquivo, ambos promovidos no Centro de Lazer da A.B.F.C. – Associação Beneficente dos Funcionáros da COSESP, Rua Pamplona, 227 – Jardim Paulista, na modalidade de Pedras Runas: “Semana Mística” realizada no período de 13/04 a 16/04/1993 (assinado pela Supervisora Administrativa, Cleise Zolin Garjulli) e “II Semana Esotérica” realizada no período de 31/01 a 03/02/1995 (assinado pelo Coordenador de Lazer da ABFC: Gilberto Ruffo Filho). Nos meses de março, abril e maio de 1994, diariamente realizei atendimentos na leitura e orientação de Runas, no IBCA – Instituto Brasileiro de Cromoterapia Avançada, Rua Tupi, 540 – Pacaembu (Santa Cecília), São Paulo (SP). Formado pela Escola Panamericana de Arte de São Paulo, atuei como fotógrafo autônomo em revistas e como free-lancer na área, tendo um vasto banco de imagens, principalmente de turismo. Gosto de retratar características arquitetônicas de grandes capitais, sobretudo. Do lado esquerdo da tela o meu 3º cartão de visita impresso em papel cartão branco grafado com letras pretas e título de cor violeta: “RUNAS, Sérgio Eduardo Sakall, Rua Serra de Juréa, 799 – apto. 104, CEP: 03323-020 – Tatuapé – S. Paulo, E-mail: runas@uol.com.br, Telefone: (011) 6941-9224”. Do lado direito, meu 4º cartão de visita impresso em papel fotográfico, grafado com letras pretas, cuja propaganda com foto still-life tirada em 2000 mostra uma garrafa de vinho tinto ao lado de uma taça cheia: “Fotos Artísticas, Sérgo Eduardo Sakall, Fone: (11) 6941-9224, E-mail: fotossakall@uol.com.br”. Nota: Meu 2º cartão de visita foi “RUNAS, Ségio Eduardo, Rua Cantagalo, 427 – Tel. 941-9224 – Tatuapé – São Paulo”. Com o tempo realizei diversas exposições fotográficas individuais, entre elas: “De Olho na Liberdade” (2000), “Revelando o Bairro do Tatuapé Hoje” (2000), “Um Sonho de Caminho pelo Reino da Espanha” (2000), “Festa do Divino” (2001), todas através de Secretaria de Cultura do Município de São Paulo. Assim como ministrei palestras sobre o processo de inspiração para fotografar e escrever percorrendo o Caminho de Santiago de Compostela e sobre a História da Fotografia no Brasil. Adotei também as profissões de poeta e escritor, publicando no dia 19 de junho de 1999, de forma totalmente independente, minha primeira obra: “Atmospheras Humanas”. Esse livro contém poesias filosóficas de dimensões inusitadas que representam ideais e reflexões sobre o comportamento humano. Mesmo abordando assuntos palpitantes com profundidade nos sentimentos, acredito fazer um passeio pelas veredas da mente, numa literatura que representa a ficção, a poesia, o sonho, a crônica e por diversas vezes a realidade de todos nós. Um livro que traça um paralelo entre o inóspito e ininteligível do nosso interior, ainda analisa os fenômenos da querência e da insensatez humana, numa linguagem contundente. Posteriormente, participei de várias antologias e concursos literários. Paralelamente e desde cedo, sou colecionador temático sobre a família dos girafídeos, a qual compreende duas espécies endêmicas do Continente Africano: as girafas e os ocapis. Veja na página Mídia os cartões de visita feitos para Girafamania! • Clube dos Escritores Piracicaba, Rua Jacob Diehl, 77 – Bairro Morumbi, Piracicaba (SP) – Membro Titular Iniciante, 10/11/1999. Diploma registrado no livro nº 001, folha 295, em Piracicaba aos 16/11/1999. Diretor do Departamento de Honrarias e Méritos: Haldumont Nobre Ferraz. Presidente: Carlos Moraes Junior. Notas: divulgação, poesia. • Os Alquimistas – São Paulo (SP). Conheça a história desse Grupo de Artistas! • SOS Mata Atlântica (www.sosmatatlantica.org.br), São Paulo (SP). Notas: ongs, 27/05. Companhias aéreas parceiras no Programa Smiles: GOL/VARIG (voegol.com.br), Air France (airfrance.com.br), KLM, American Airlines e Delta Air Lines. Um lindo mangá representando o autor de Girafamania (eu e as eternas girafas espelhadas na lente de uma máquina fotográfica), by Lucas Shindi Sakaguti, presente de Lídia no meu aniversário de 2006. Nota: Maria I (1516-1558) da Casa de Tudor, foi Rainha da Inglaterra e da Irlanda desde 1553 até à sua morte. É lembrada pela sua tentativa de restabelecer o Catolicismo como religião oficial, depois do movimento Protestante iniciado nos reinados anteriores. Para tal mandou perseguir e executar cerca de 300 alegados heréticos, o que lhe valeu o cognome Bloody Mary (Maria, a Sanguinária) e deu nome ao drinque de suco de tomate e vodca (que é a bebida nacional da Rússia)... Muitas de suas iniciativas políticas foram abandonadas pela sua sucessora Isabel I.
Ingredientes do Frozen Margarita (nunca Marguerita que se trata de uma pizza): 1 dose de Tequila branca, ½ dose de Cointreau, 1 dose de suco de limão e 4 pedras de gelo. Modo de fazer: Bata todos os ingredientes no liquidificador. Esfregue um limão na borda de uma taça de coquetel duplo e role no sal fino para formar uma crosta. Decore com uma rodela de limão. Margarita foi inventado em Dallas, EUA, pela socialite Margarita Sames, em 1948. *² A socióloga e presidente da ONG DaVida, Gabriela Leite, defende a profissão de prostituta. Conheci no programa Roda Viva da TV Cultura, no dia 01/06/2009; como dizem, antes tarde do que nunca. Super verdadeira, honesta e feliz. Adorável! Desejo-lhe toda a sorte do mundo! 2. Del Rei (azul-marinho; 1985) – uma “banheira” que eu não conseguia ter a devida dimensão ou porporção, sei lá, acho que era um “defeito” de retrovisor e não meu (risos). 3. Voyage (verde-água; 1989?) – leve demais para o meu gosto, mas sinto saudades porque sou saudosista e foi o carro que mais dirigi, era prático e fácil. Esse carro eu mesmo lavava, acredita nisso!? 4. Kadete (prata; consulente Lecia em 1996?) – Amava dirigir por diversas razões: pesado, confortável e sobretudo “confiável”; até “me sentia”, mas morria de medo porque ele era muito potente para mim que estava acostumado com o anterior. 5. Corsa Wagon (prata; 2000?) – Odiei! Mas ficamos anos com esse carro e ele me levou para todos os lugares, como na Chapada dos Veadeiros, por exemplo... sou grato a isso! 7. Astra HB Advantage 2.0 Flex (bege artio; 23/09/2009) – Como adoramos e não tivemos problemas com o carro anterior, compramos o mesmo modelo na versão quatro portas. A trava de segurança melhorou, pois ao desligar o carro elas abrem automaticamente. A luz embutida no retrovisor para iluminar o câmbio é um charme. * “Fome de Viver” (The Hunger) – Não à toa, considera-se que este filme possui a maior cena de sedução da história do cinema. Não é sempre que se vê Catherine Deneuve “cantando” Susan Sarandon ao som de Lakmé, do compositor Délibes. Trata-se de um filme que se inicia com “Bela Lugosi’s Dead”, do Bauhaus, e tem uma trilha sonora de primeira qualidade, além de contar com David Bowie no elenco. Segundo o livro, a casa do casal de vampiros ficava na Sutton Place, bairro mais que exclusivo de Nova Iorque. Nota: Em 1979, Nelson Gonçalves e Emílio Santiago regravaram a música e, em 1980, Beth Carvalho a regravou. De origem etrusca, Sérgio quer dizer o que é servo, escravo, romano, nome de família, surgiu como nome de um clã na Antiga Roma e, anos mais tarde, tornou-se prenome. Sérgio é um nome originado do latim “Sergius” e existem vários significados: 'guardião, o que protege', aquele que cuida e protege, trabalhador incansável, ou servo. Outra interpretação adequada que encontrei: Sérgio significa uma pessoa generosa e um idealista cândido que procura uma fé, uma verdade que o ajude a viver. É um ser complexo, com uma inquietação especial, que tanto exprime a emoção e o belo, como o desespero e o abandono. Pode surpreender ou incomodar, mas nunca nos deixa indiferentes. Eduardo é um nome originado do inglês (anglo-saxão) “Edward”, nome muito usado nas casas reais inglesas, e quer dizer “guardião próspero”; do anglo-saxão “Hrod-ward ou Eadward sone = filho de Eduardo”. Eduardo é de origem anglo-saxã e significa 'guardião das riquezas', aquele que sabe proteger sua fortuna; protetor de riquezas... Notas: Édison, Édisson ou Édson é um nome britânico e significa grande filho. Já Duarte origina do portugês e é abreviação de Eduardo. Sérgio: Caráter viril, homem energético, perspicaz e corajoso. O primeiro ideograma pode ser lido como “se” – tem o sentido do rio que corre rápido. O segundo ideograma pode ser lido como “ru” – significa correr (rio). O terceiro ideograma pode ser lido como “dji” – e se refere a si mesmo. O quarto ideograma pode ser lido como “o” – significa homem. O segundo bloco de ideogramas pode ser lido: e – do – aru – do. Os dois primeiros ideogramas que se le Edo, era o nome antigo da cidade de Tóquio. Saakaly de Varad foi o sobrenome de uma nobre família húngara e romena (Siebenburg), para a qual foi dado o título de nobreza por Georg Rakoczyi II, príncipe de Siebenburg, na pessoa de Johann Szakaly, sua esposa Judith Csiallayi e seus filhos Stefan e Johann. Eles receberam o título de nobreza em Szekelyhid, em 20 de dezembro de 1658. A primeira família estabeleceu-se na região de Bihar, onde seu status de nobreza foi anunciado em 8 de abril de 1659. Esta família também morou nas regiões de Abauj, Bekos e Szathmar. Membros desta linhagem obtiveram confirmação do status de nobreza em Bihar, em 1796. No campo da onomástica, o sobrenome húngaro Szakaly é classificado como sendo de origem toponímica, tais nomes referem-se e são derivados do nome do lugar onde as pessoas iniciaram sua vida, moraram ou compraram terras. Este sobrenome foi tomado diretamente de “Szakaly”, o qual é o nome da cidade localizada entre Kalocsa e Dombovar, no sudoeste da Hungria. Logo, a aparecimento deste sobrenome originou-se de uma pessoa que era identificado pelos membros de sua comunidade como aquele que veio de “Szakaly” ou “o lorde de Szakaly”. 16/08/1977 – No dia em que Elvis Presley morreu eu estava de férias em Botujuru, bairro do município de Campo Limpo Paulista (SP). 18/05/1987 – Admissão em Sorocaba. 14/10/1987 – Contrato de locação residência/floricultura (Rua Cantagalo). 25/04/1993 – Aquisição de linha telefônica (941-9224). 18/10/1993 – Reconciliação mãe. 09/04/1994 – Casamento irmão. 14/12/1994 – Contrato de locação residência (Rua Henrique Dumont). 1996: Santa Catarina; França e Mônaco. 1997: Brasília, Alagoas, Pernambuco, Rio Grande do Norte; Alemanha, Egito (“A.K.”), Argentina. 1998: Ceará; Espanha (Caminho de Santiago de Compostela), Argentina, África do Sul. 2000: Bahia; Chile (Ilha de Páscoa), França, Holanda, Peru. 2001: Amazonas, Amapá, Pará; Guiana Francesa. 2002: Rio de Janeiro, Brasília, Goiás, Paraná, Santa Catarina, Rio Grande do Sul; Paraguai, Quênia, Moçambique, Tanzânia (Ilha de Zanzibar). 2003: Minas Gerais, Paraná; Bélgica, Espanha, França. 2004: Maranhão, Paraná; Alemanha, Federação Russa, Suíça. 2005: Mato Grosso, Mato Grosso do Sul; Espanha e Portugal. 2006: Rio de Janeiro; Alemanha, Áustria, Hungria, República Tcheca. 2007: Itália, San Marino, Vaticano e Eslovênia. Selo Girafa. 2008: Alagoas, Paraíba, Minas Gerais, Paraná, Pernambuco; Colômbia, Equador (Ilhas Galápagos). 2009: Alemanha e Turquia. Realizei a Folha de São Paulo como eu quis. Trocamos de carro. 2010: Viagem de carro para a região Sul do Brasil e Uruguai. Ganhei o Laptop. Adquiri a máquina fotográfica e impressora. Assistimos ao desfile das campeãs. Matéria publicada na revista da Abril. Morte repentina de irmão. Conhecemos a ilha. Selo do Egito. Viagem a Paris e Londres (25 anos). Gylmar morreu. 2011: Visitei Denize. 29/04/2011 – Nascimento de Enzo. Meu aniversário em Curitiba. União Estável. 2ª vez na ilha. Batizado de Enzo. Apartamento 18/11/11. Viagem ao Piauí. 2012: Reforma do banheiro. Buenos Aires. Festa de Enzo. Reforma do apartamento. E-mails: Lídia, Eliana, Portal Educação, Valéria. Telefonemas: Eliana (Mônica), Acácia, Sarita, Marilene, Katia, Celina, Soraia, D. Miriam, Rosana. 3ª vez na ilha. Natal em casa.